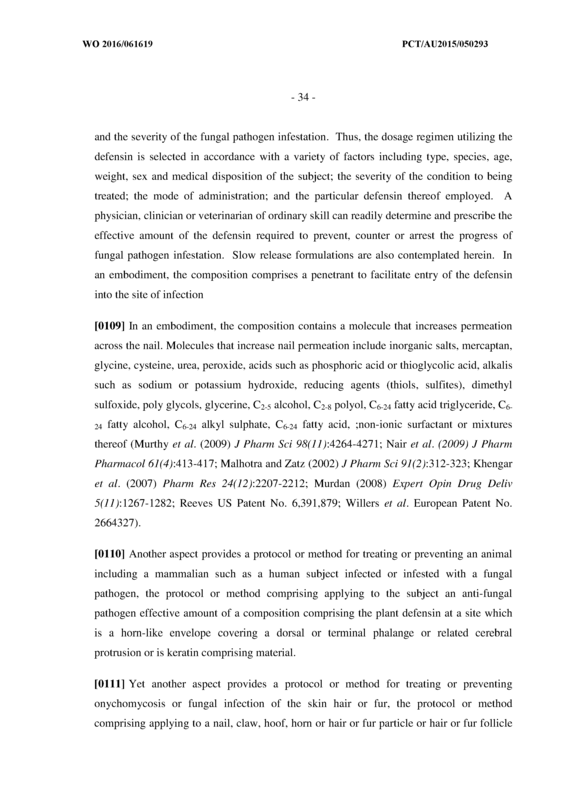 The present disclosure relates to the control of fungal infection of horn-like envelopes covering dorsal and terminal phalanges in humans and animals and related cerebral protrusions in animals as well as keratin comprising material on surfaces of humans and animals. 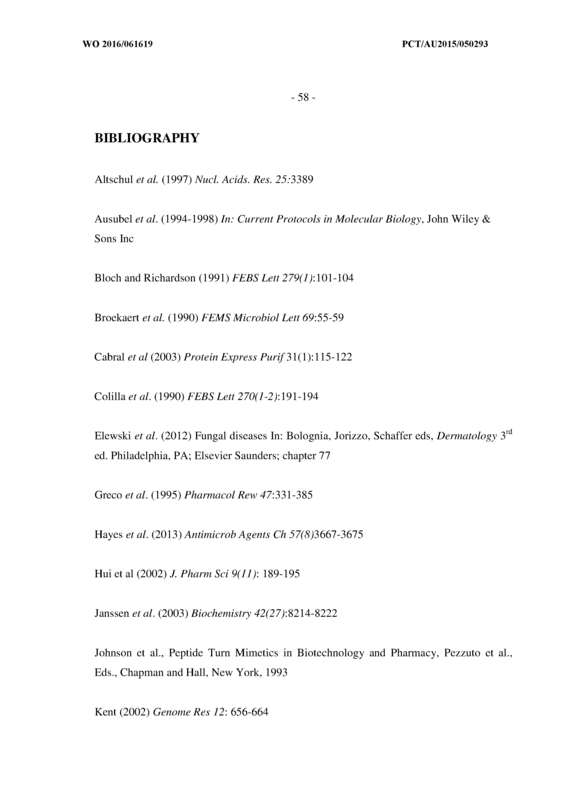 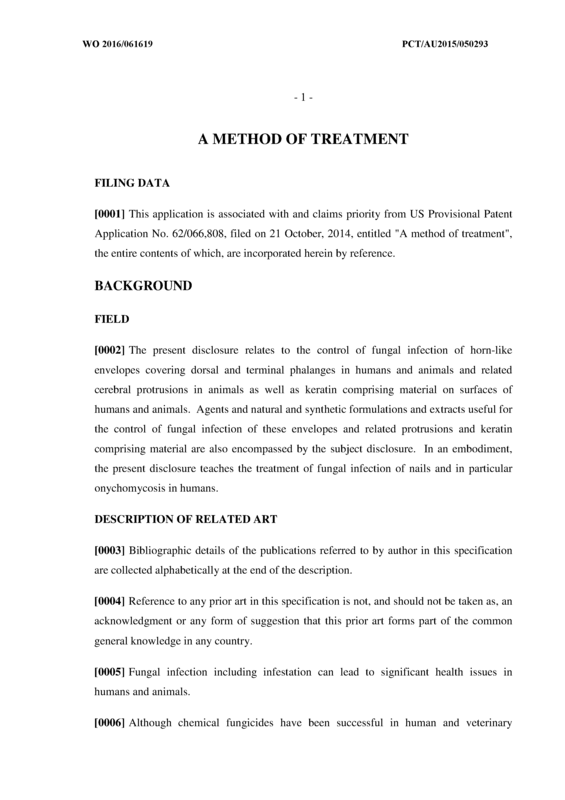 Agents and natural and synthetic formulations and extracts useful for the control of fungal infection of these envelopes and related protrusions and keratin comprising material are also encompassed by the subject disclosure. 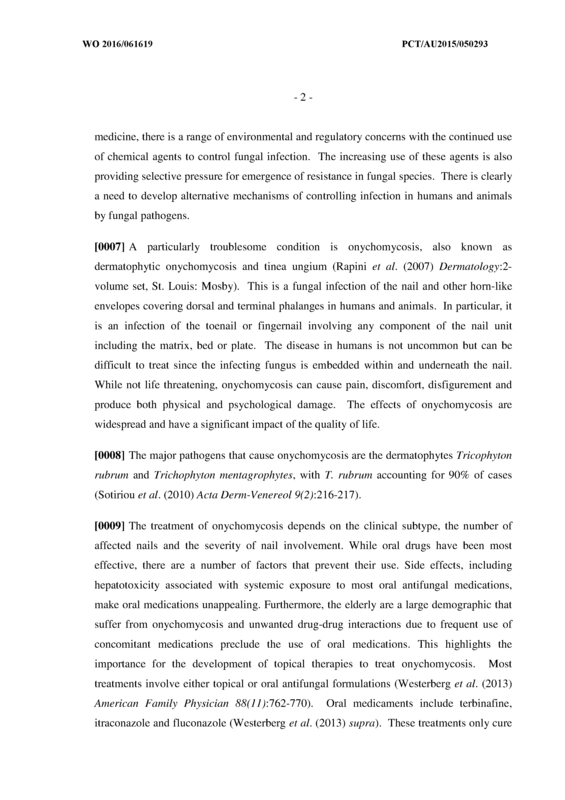 In an embodiment, the present disclosure teaches the treatment of fungal infection of nails and in particular onychomycosis in humans. 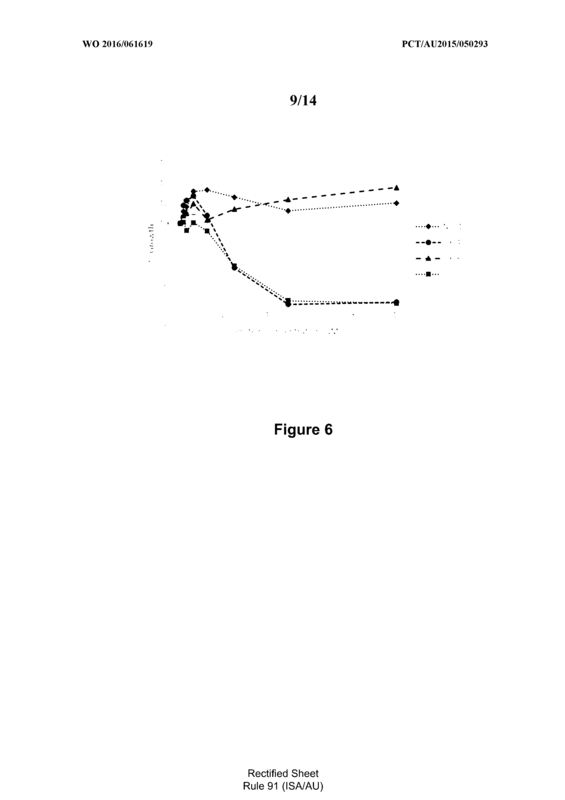 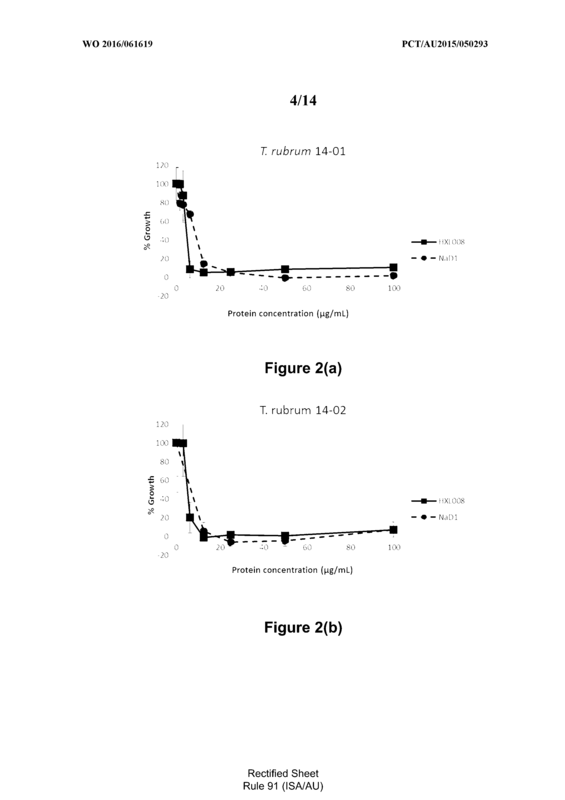 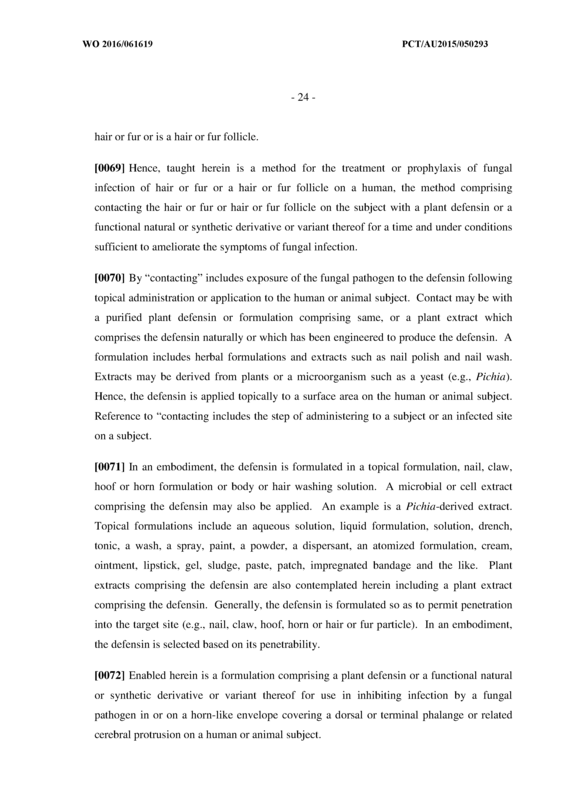 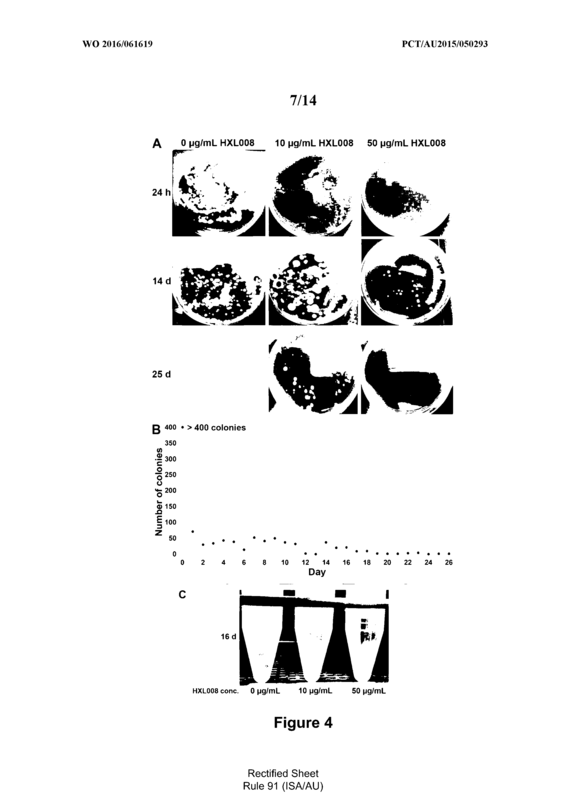 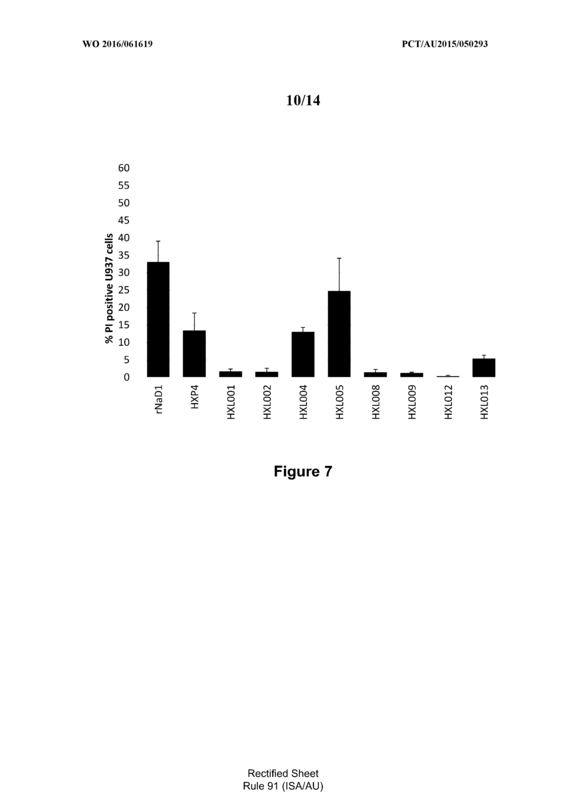 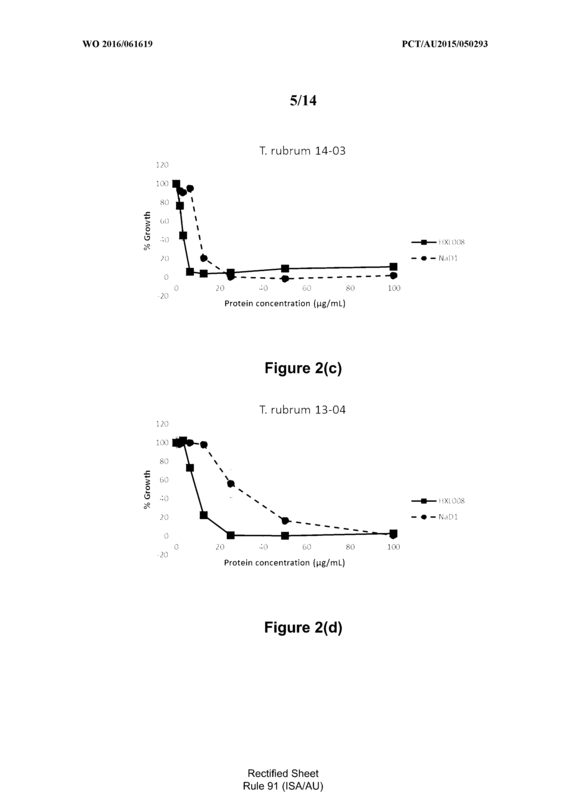 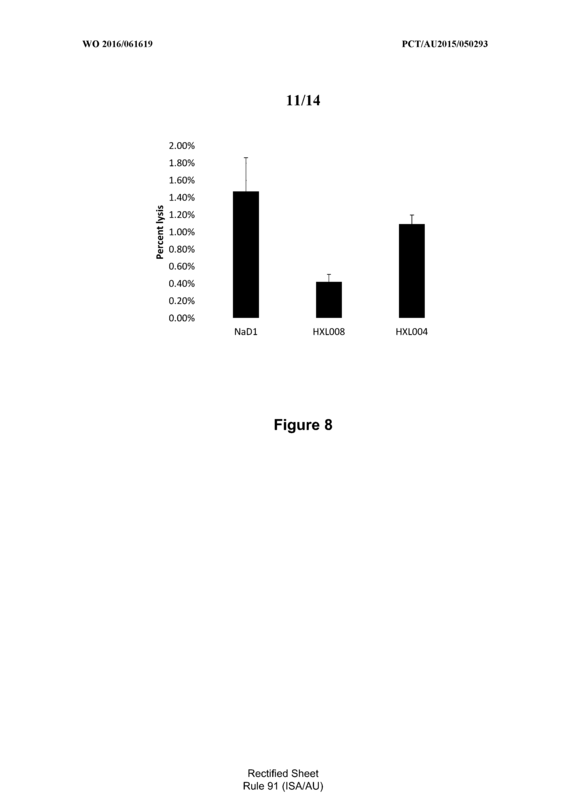 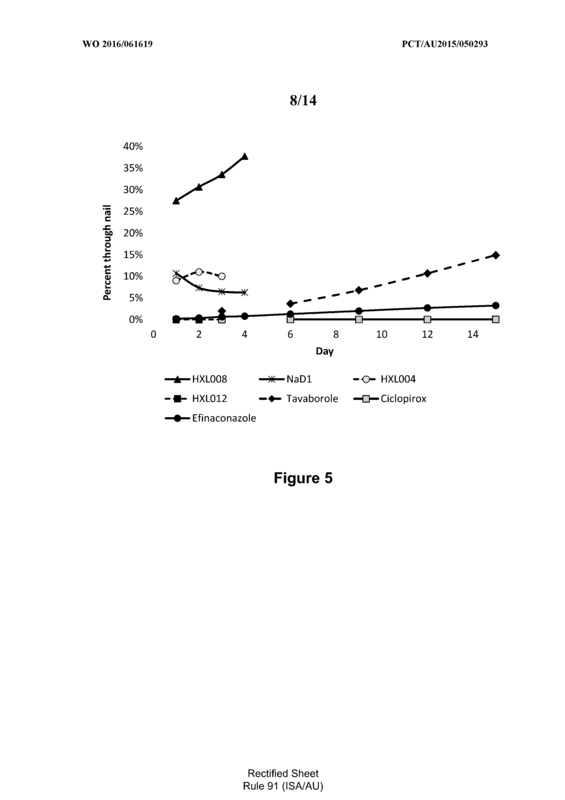 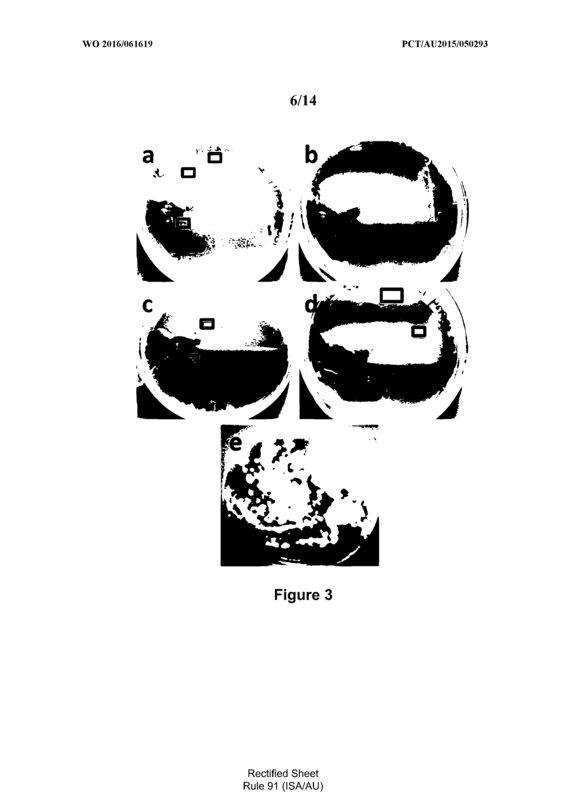 A method for inhibiting infection of a fungal pathogen on a horn-like envelope covering a dorsal or terminal phalange or related cerebral protrusion or keratin comprising material or follicle for the keratin comprising material on a subject, said method comprising contacting the envelope or protrusion or keratin comprising material with an effective amount of plant defensin selected from SEQ ID NO: l through 47 or a functional natural or synthetic derivative or variant thereof or a defensin having at least 80% similarity to any one of SEQ ID NO: l through 47 after optimal alignment or a defensin selected from SEQ ID NO: l through 23 with an N-terminal alanine residue (SEQ ID NO:25 through 47) for a time and under conditions sufficient to ameliorate symptoms of the infection. 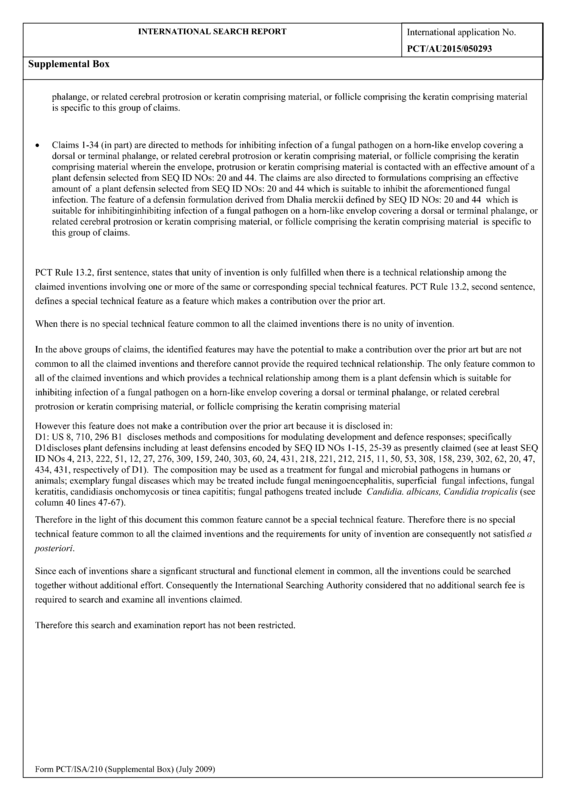 The method of Claim 1 wherein the envelope is a toe or finger nail, claw or hoof and the related cerebral protrusion is a horn. 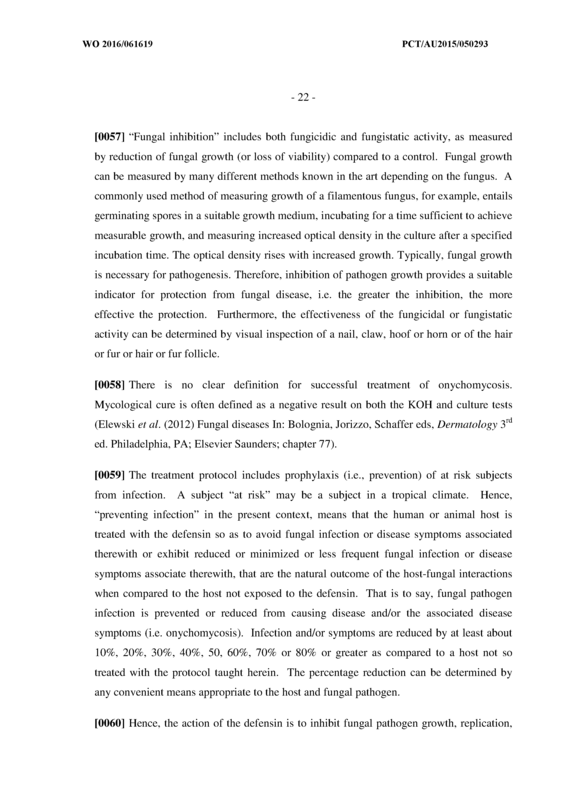 The method of Claim 2 wherein the infection is associated with onychomycosis or a related condition. 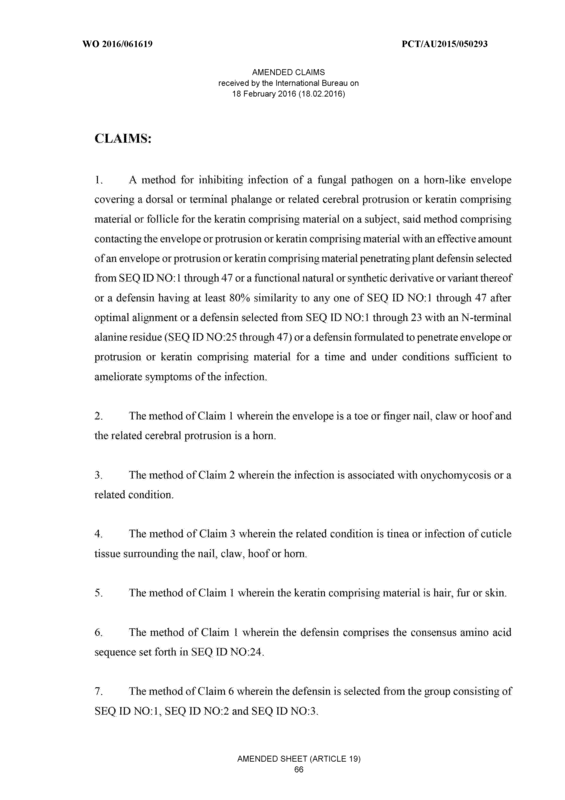 The method of Claim 3 wherein the related condition is tinea or infection of cuticle tissue surrounding the nail, claw, hoof or horn. 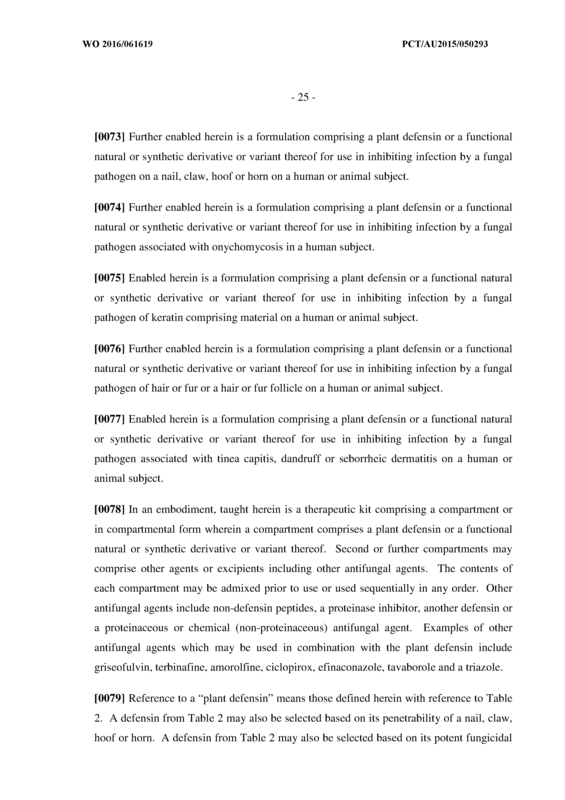 The method of Claim 1 wherein the keratin comprising material is hair, fur or skin. 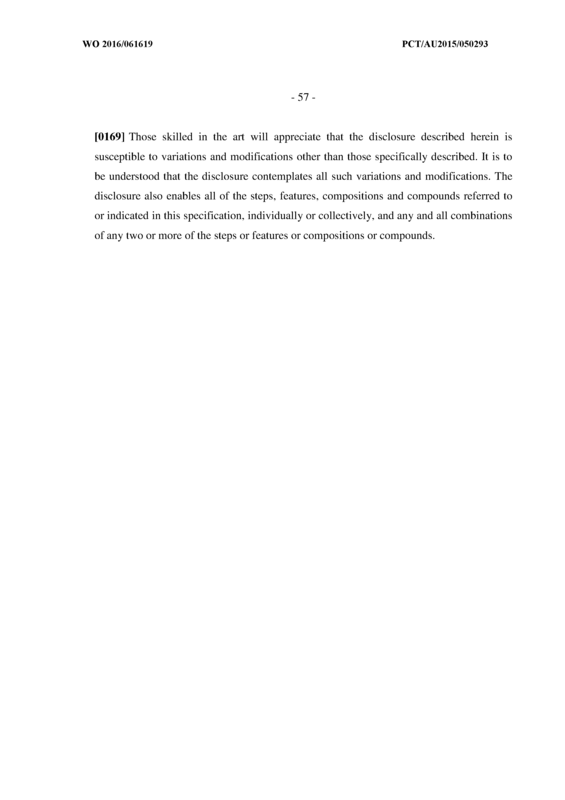 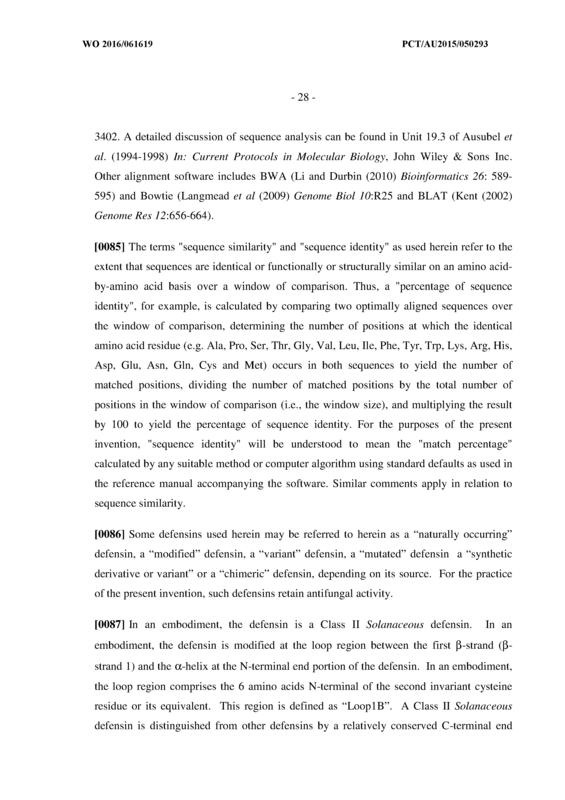 The method of Claim 1 wherein the defensin comprises the consensus amino acid sequence set forth in SEQ ID NO:24. 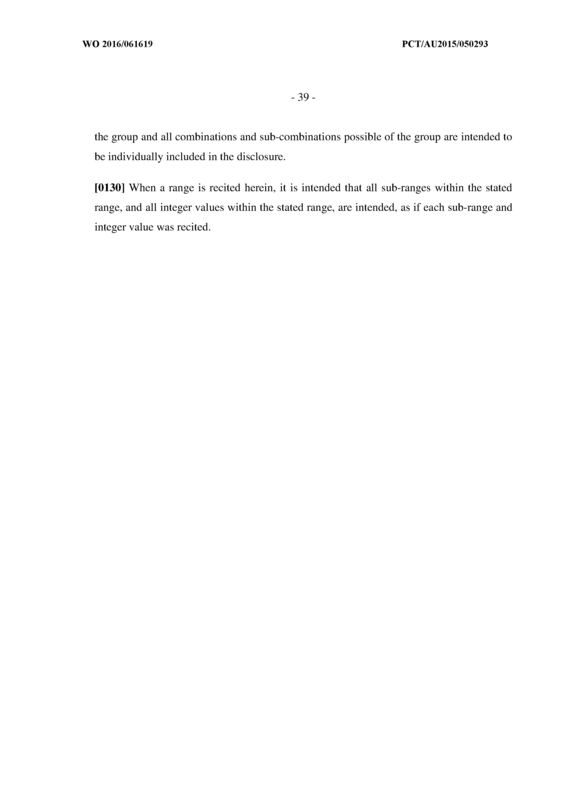 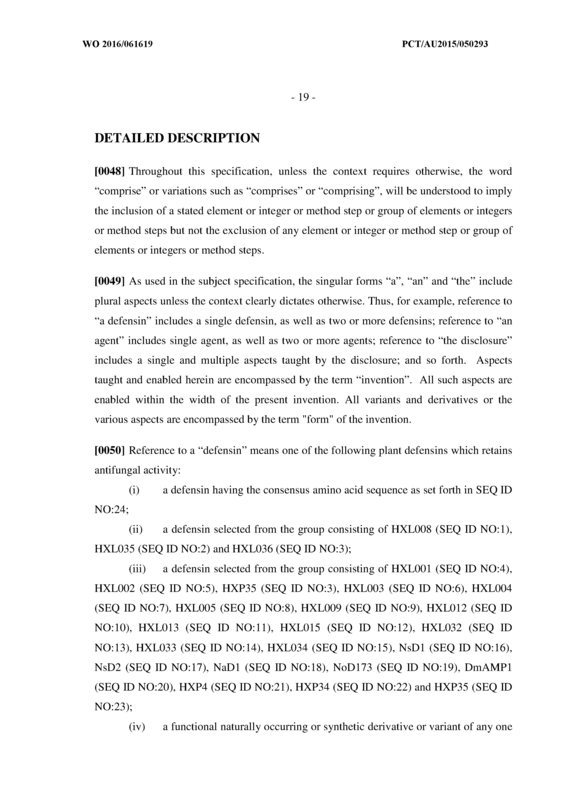 The method of Claim 6 wherein the defensin is selected from the group consisting of SEQ ID NO: l, SEQ ID NO:2 and SEQ ID NO:3. 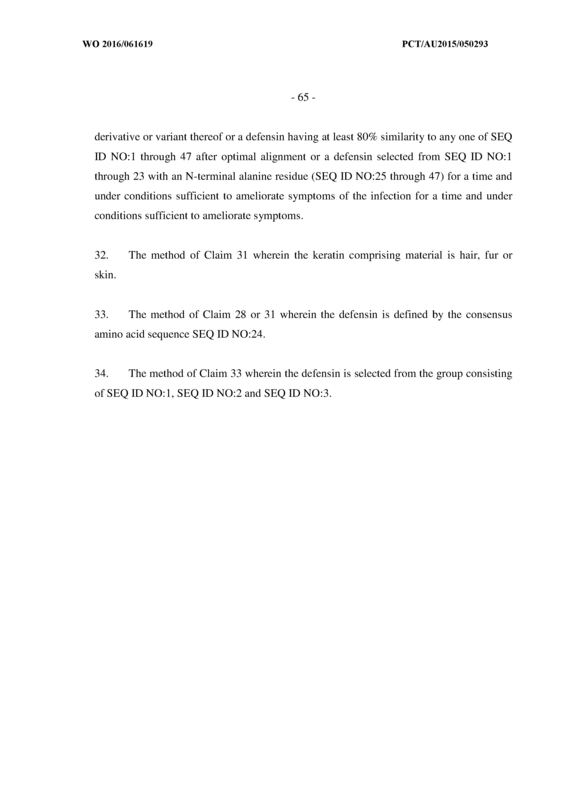 The method of Claim 1 wherein the defensin is selected from the group consisting of SEQ ID NO:4 through 23 and SEQ ID NO:25 through 47. 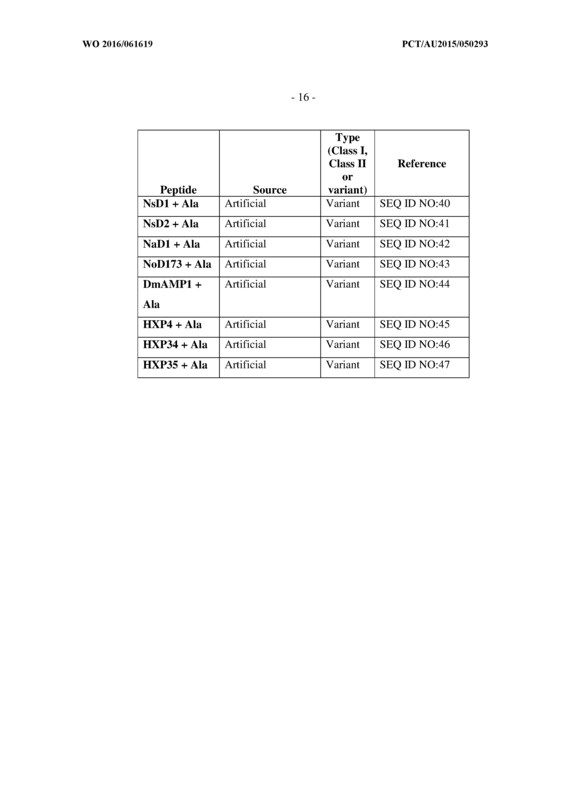 The method of Claim 1 wherein the defensin variant comprises a Loop IB from a Class I defensin replacing the corresponding Loop IB from a Solanaceous Class II defensin. 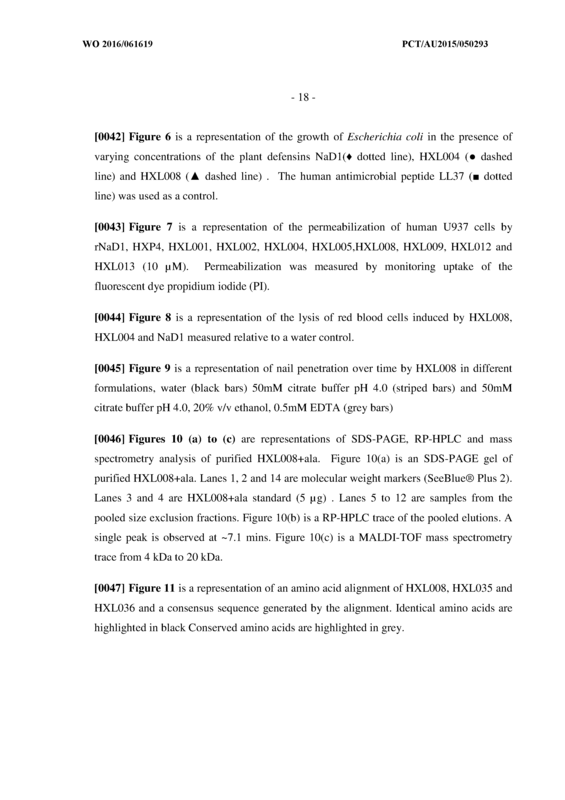 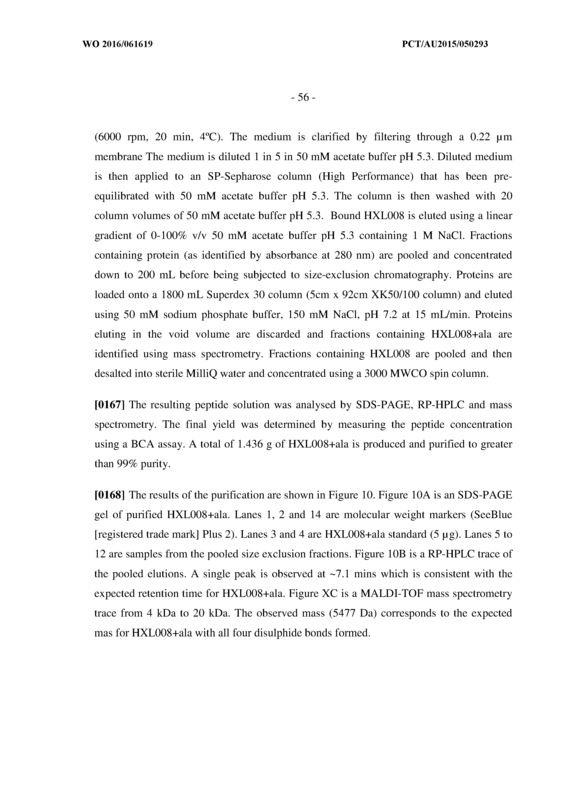 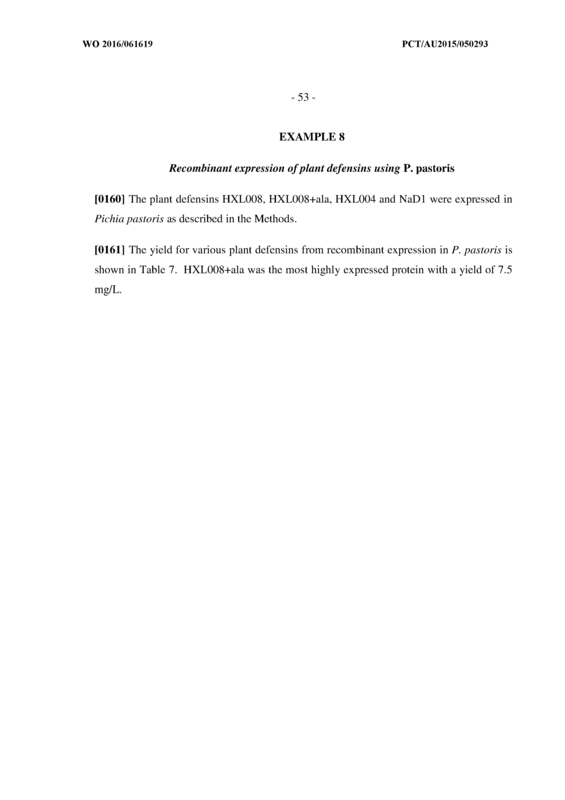 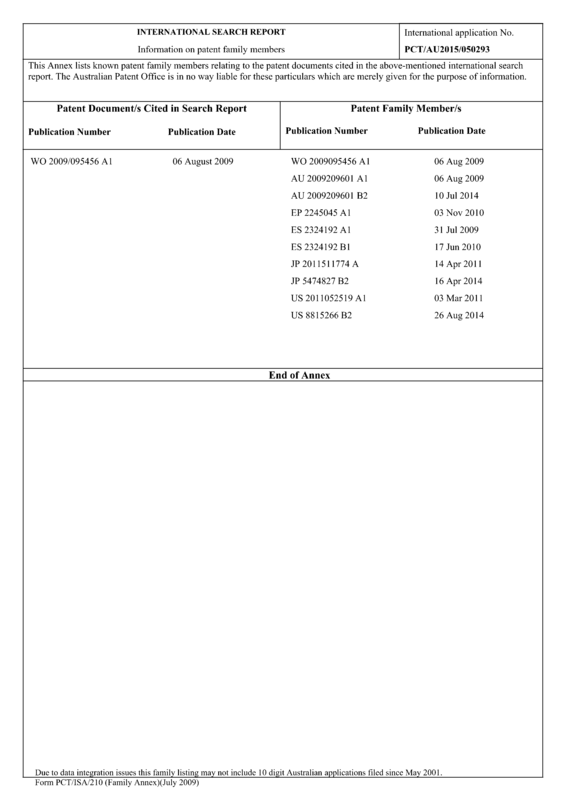 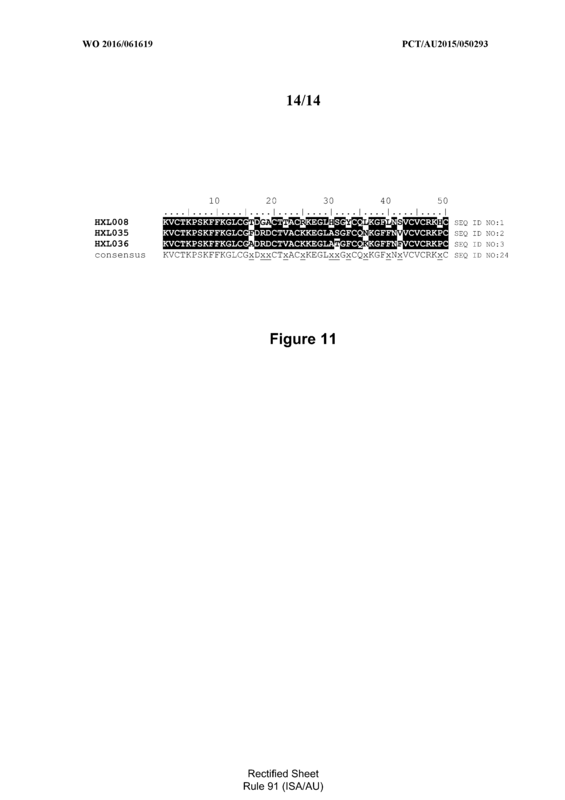 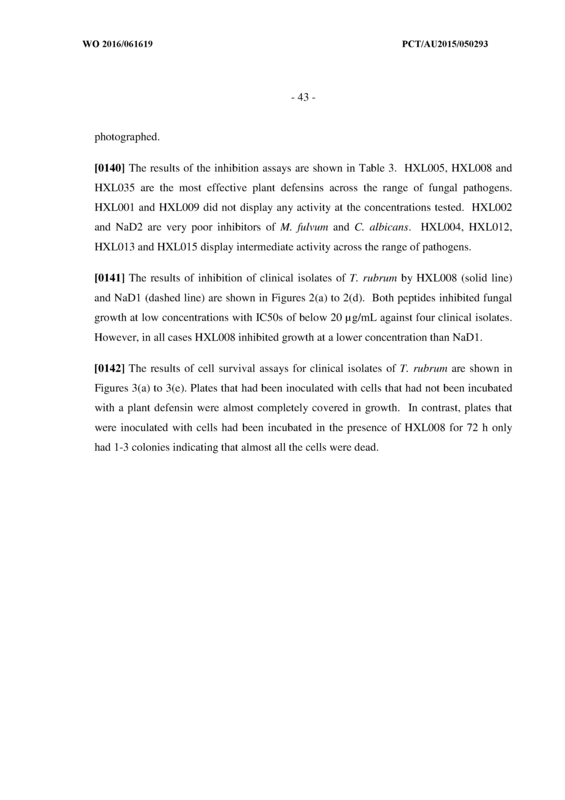 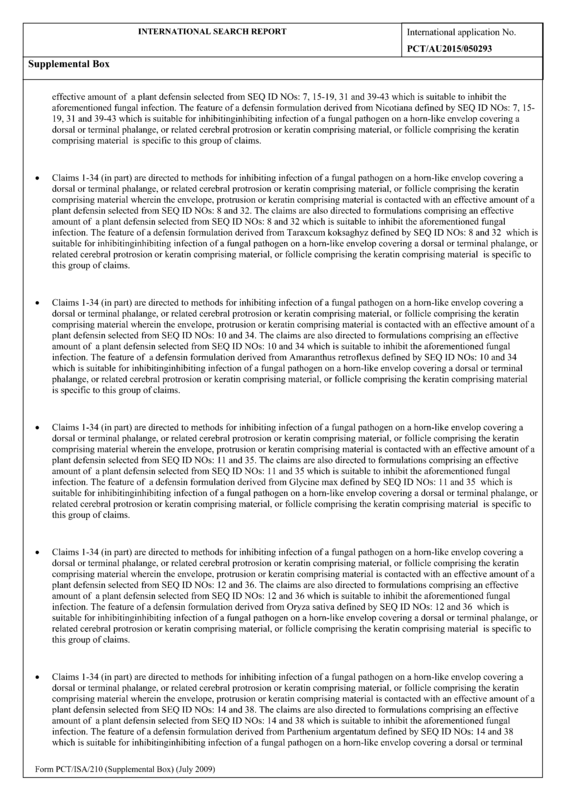 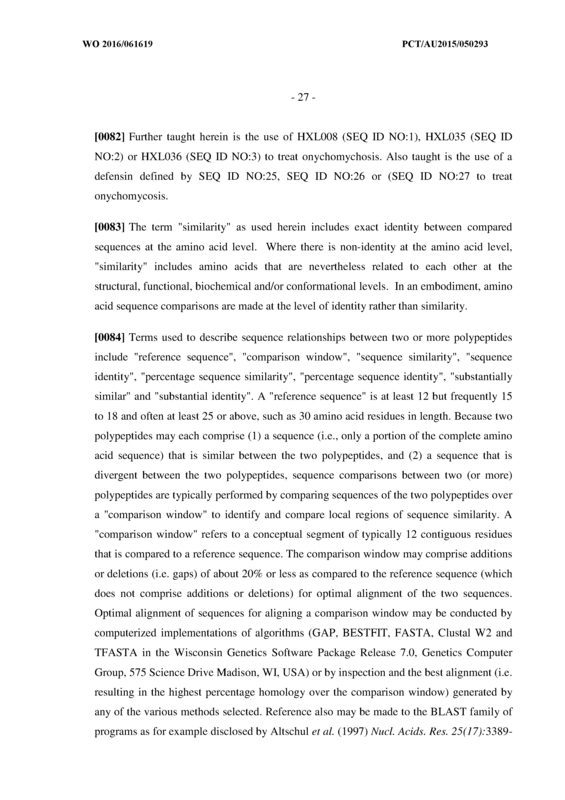 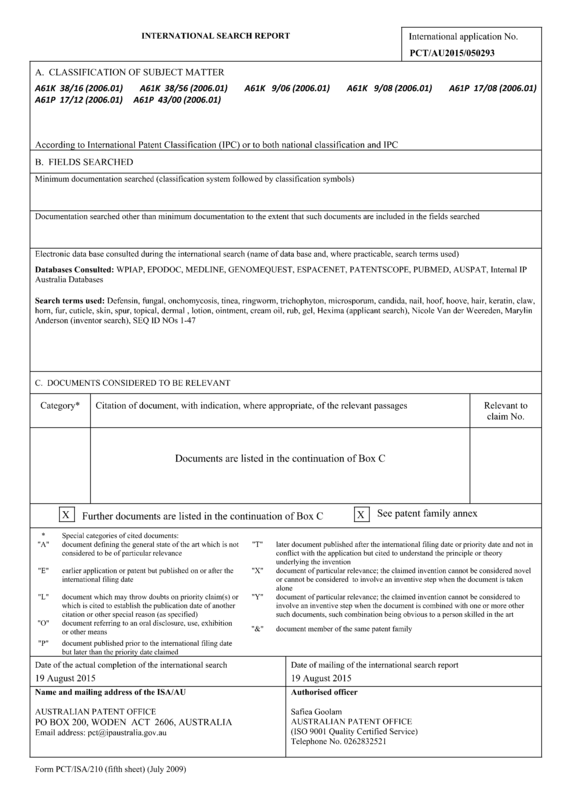 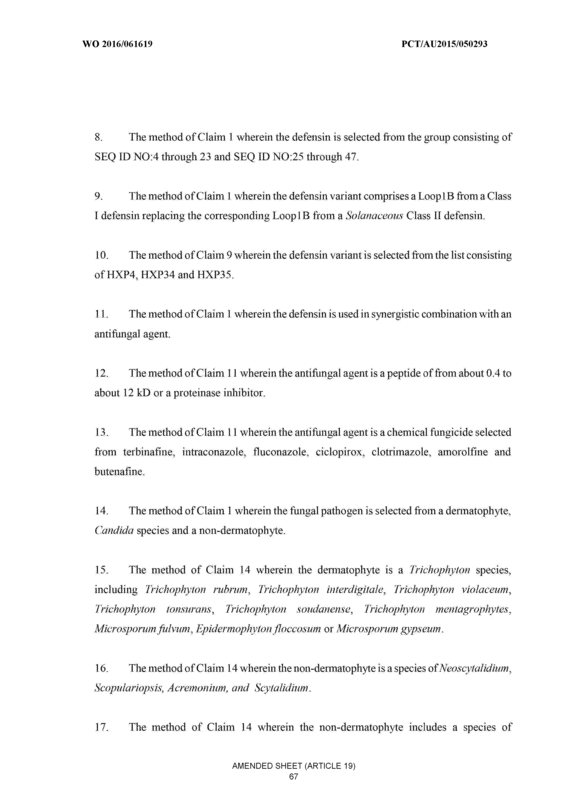 The method of Claim 9 wherein the defensin variant is selected from the list consisting of HXP4, HXP34 and HXP35. 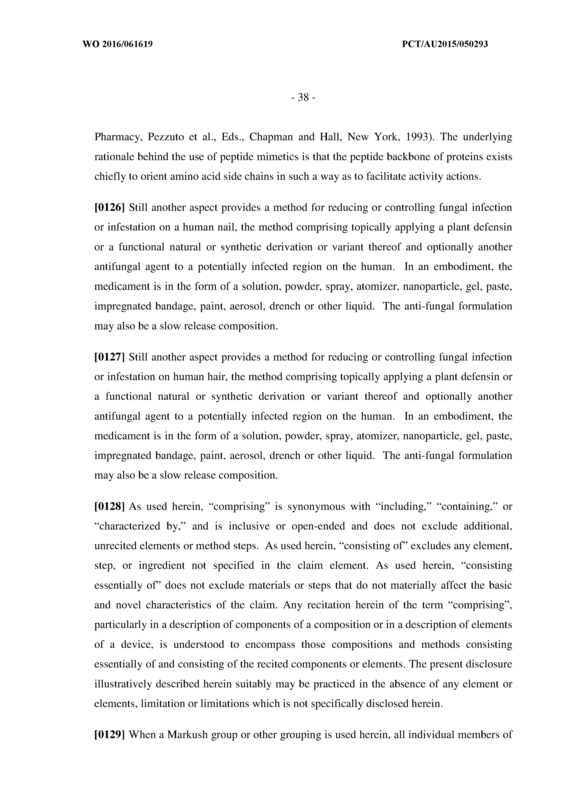 The method of Claim 1 wherein the defensin is used in synergistic combination with an antifungal agent. 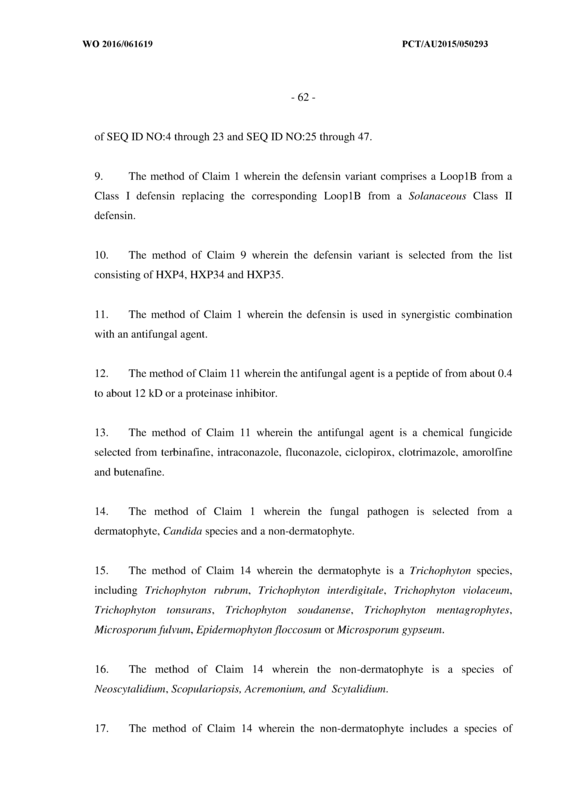 The method of Claim 11 wherein the antifungal agent is a peptide of from about 0.4 to about 12 kD or a proteinase inhibitor. 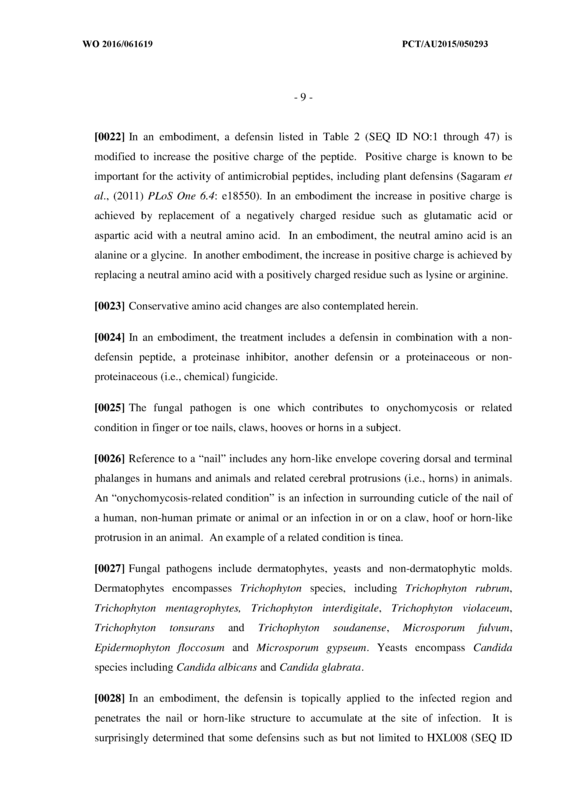 The method of Claim 11 wherein the antifungal agent is a chemical fungicide selected from terbinafine, intraconazole, fluconazole, ciclopirox, clotrimazole, amorolfine and butenafine. 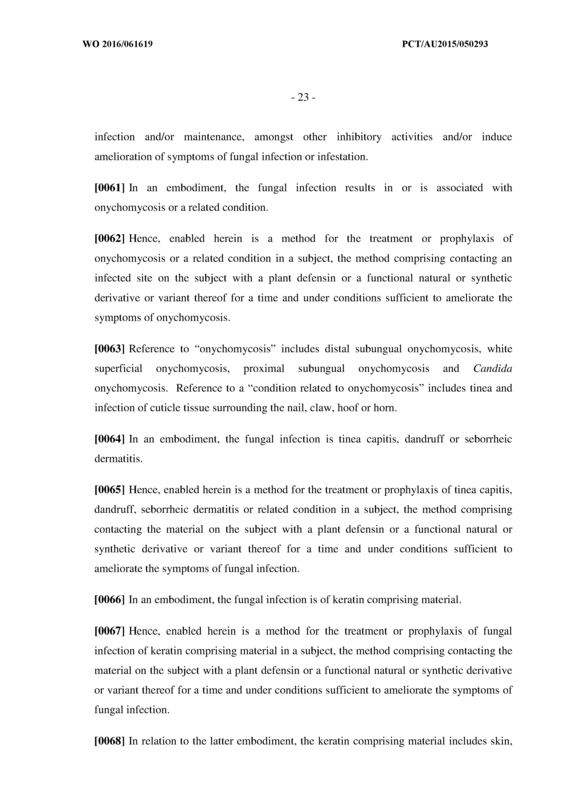 The method of Claim 1 wherein the fungal pathogen is selected from a dermatophyte, Candida species and a non-dermatophyte. 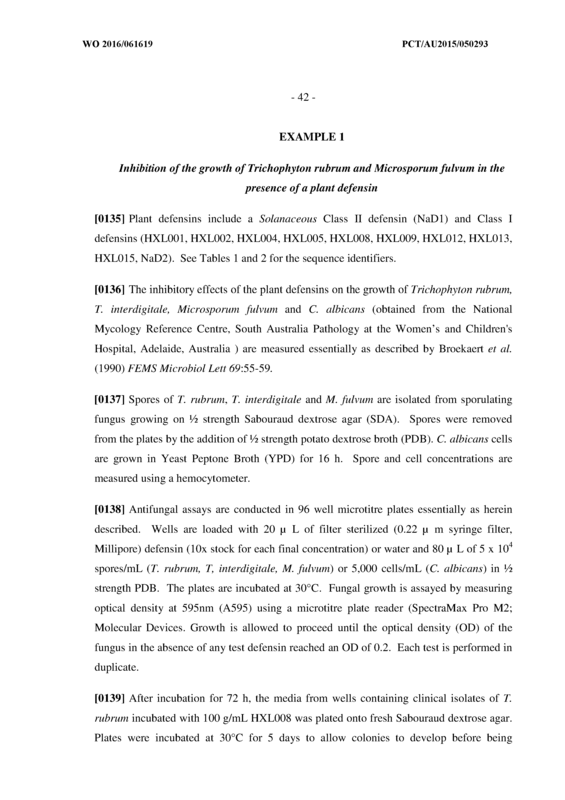 The method of Claim 14 wherein the dermatophyte is a Trichophyton species, including Trichophyton rubrum, Trichophyton interdigitale, Trichophyton violaceum, Trichophyton tonsurans, Trichophyton soudanense, Trichophyton mentagrophytes, Microsporum fulvum, Epidermophyton floccosum or Microsporum gypseum. 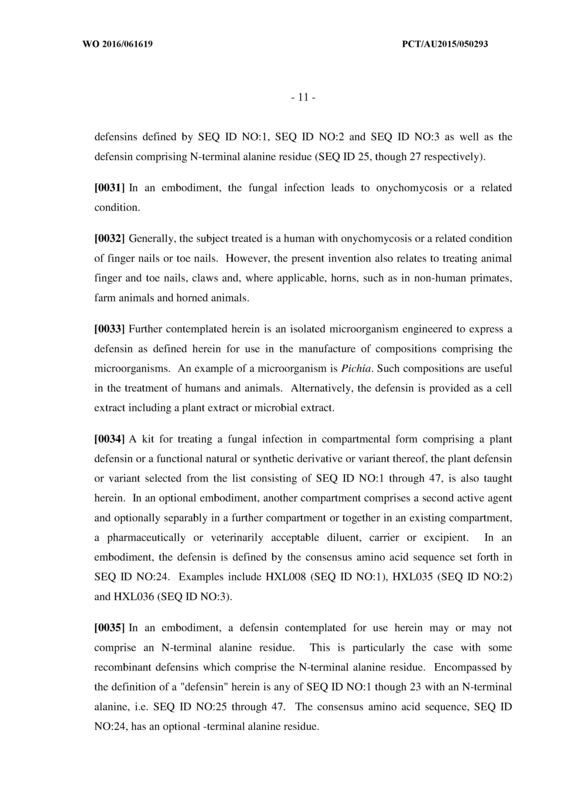 The method of Claim 14 wherein the non-dermatophyte is a species of Neoscytalidium, Scopulariopsis, Acremonium, and Scytalidium. 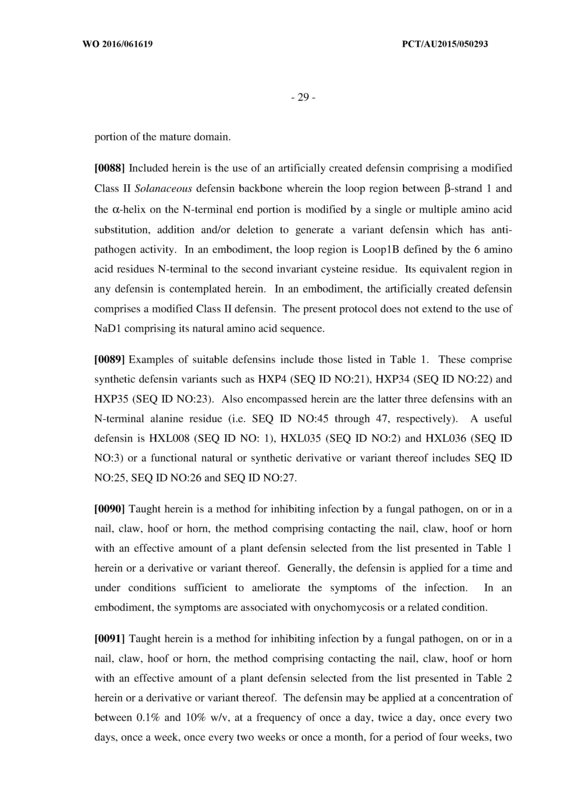 The method of Claim 14 wherein the non-dermatophyte includes a species of Neoscytalidium and Scopulariopsis. 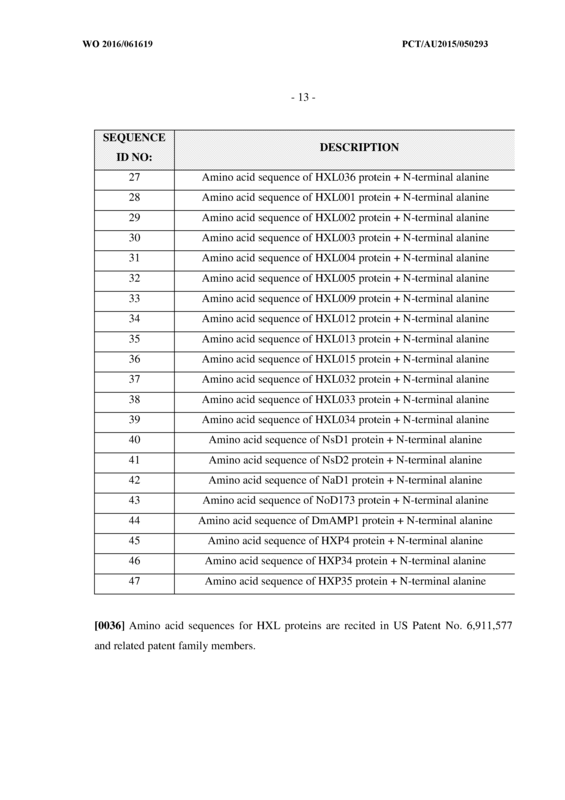 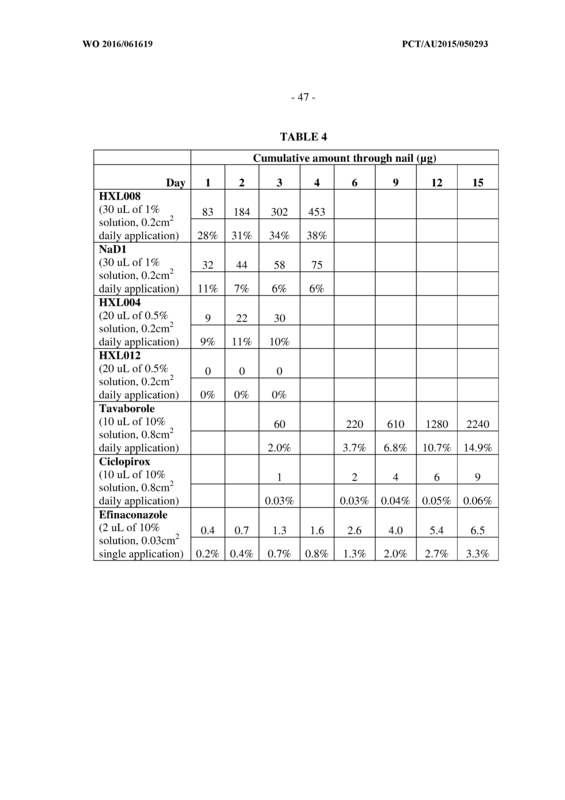 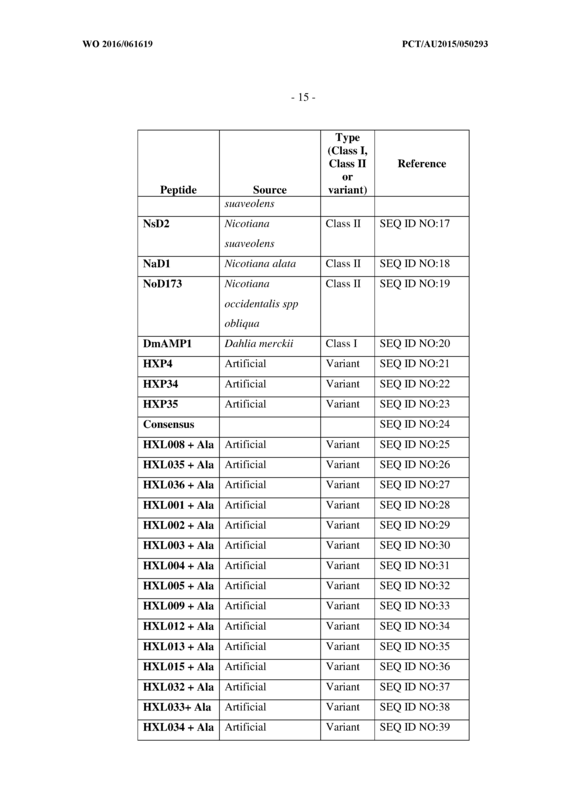 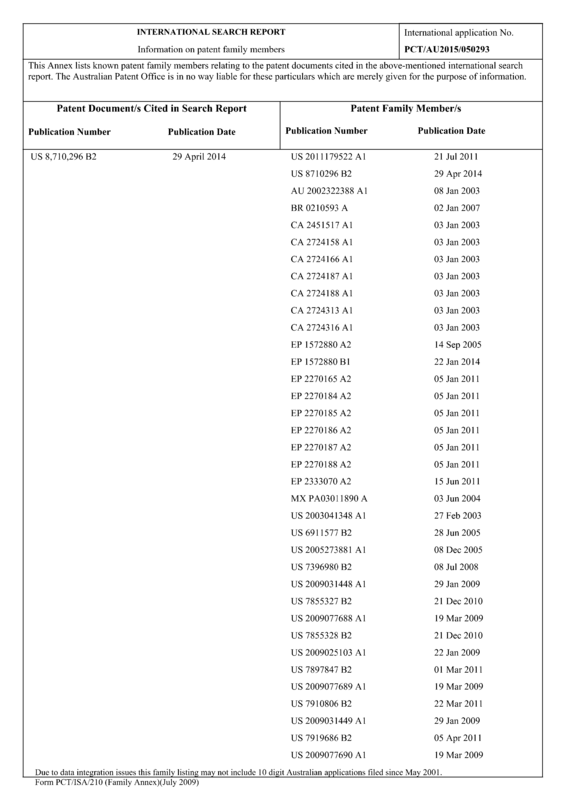 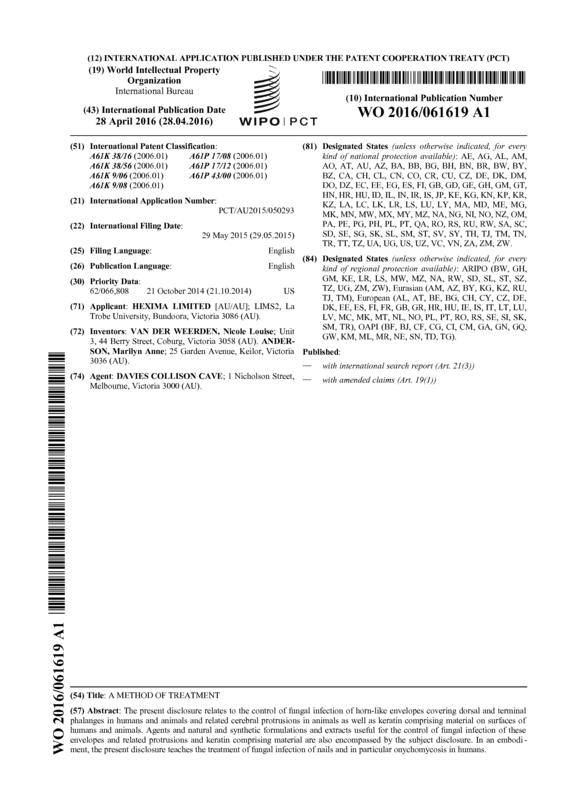 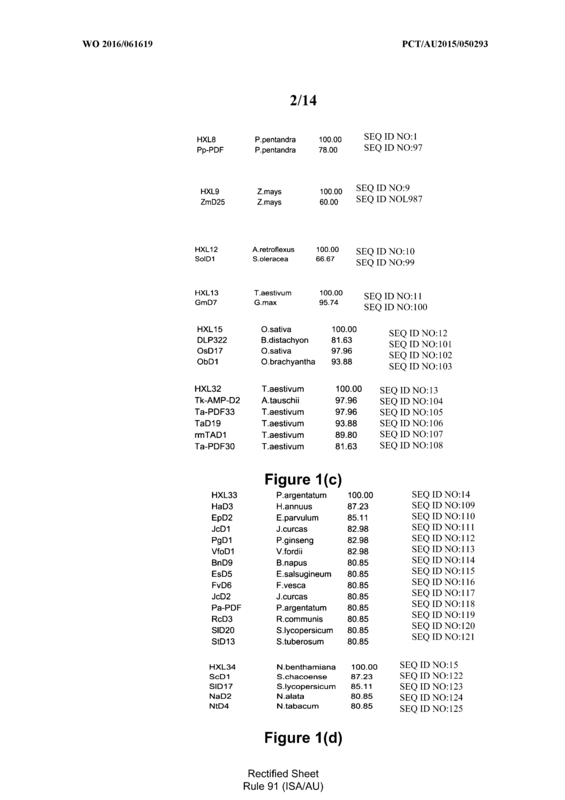 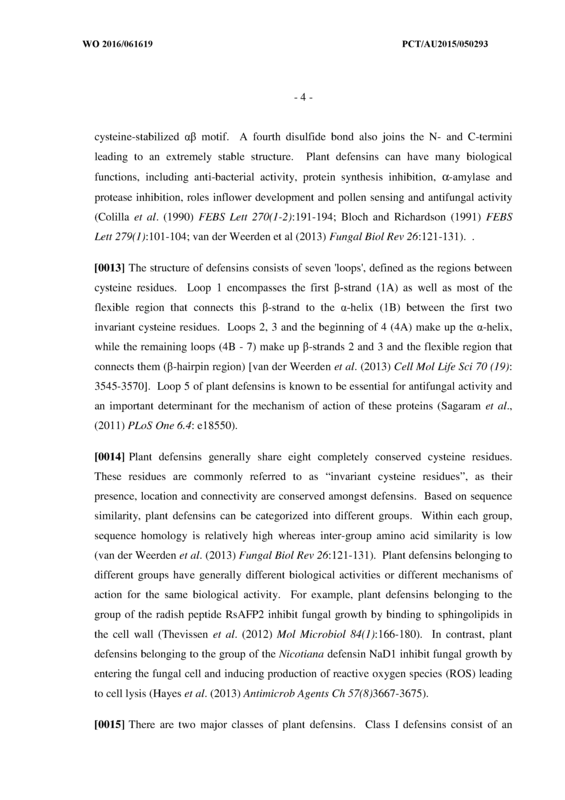 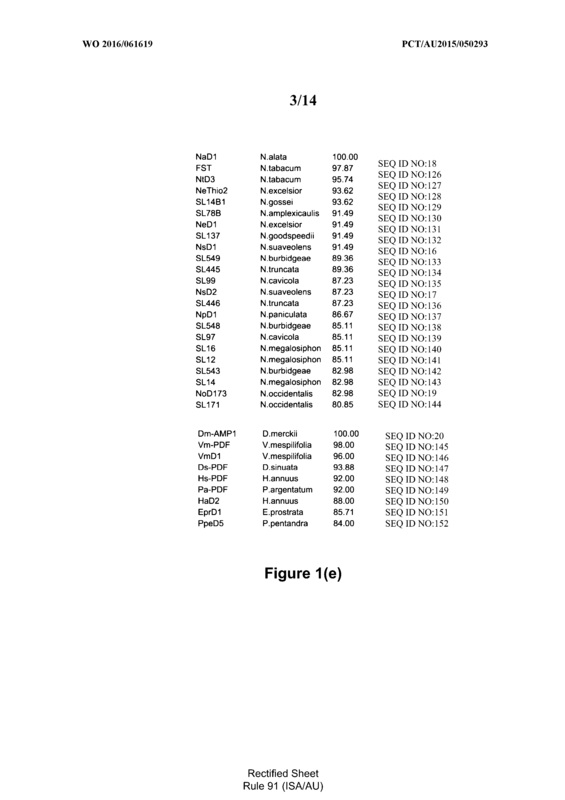 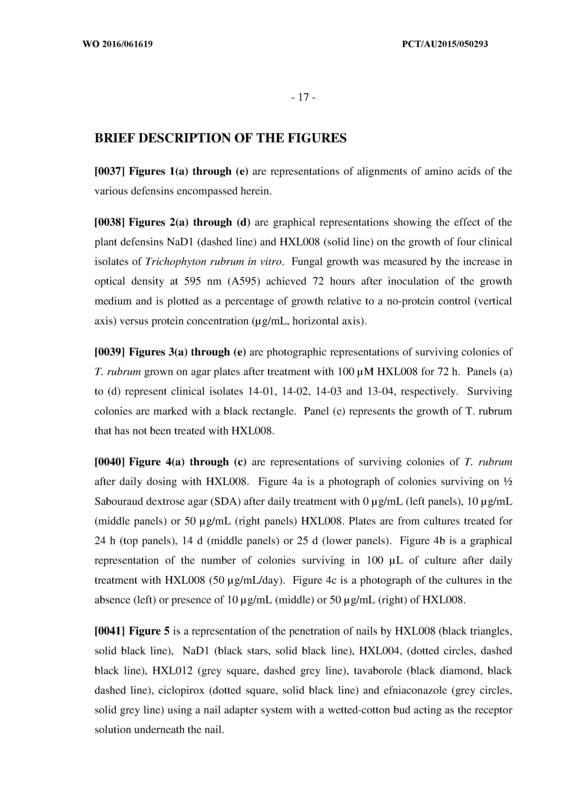 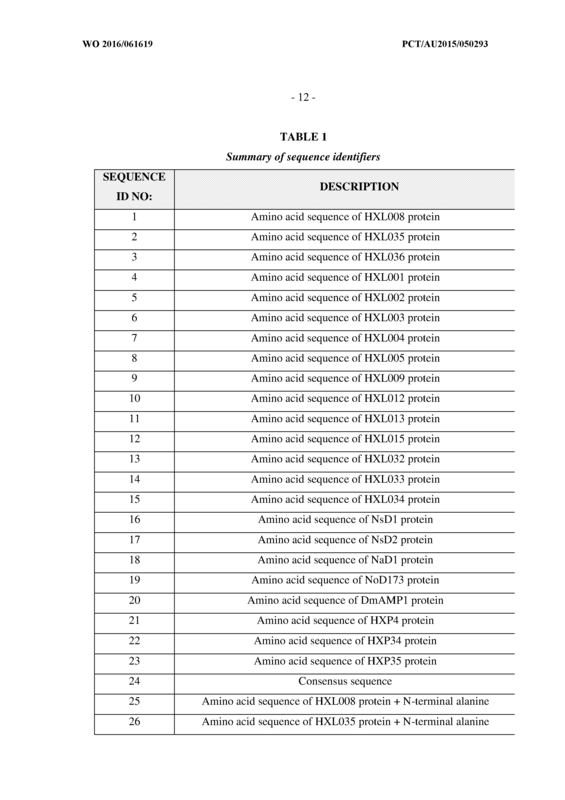 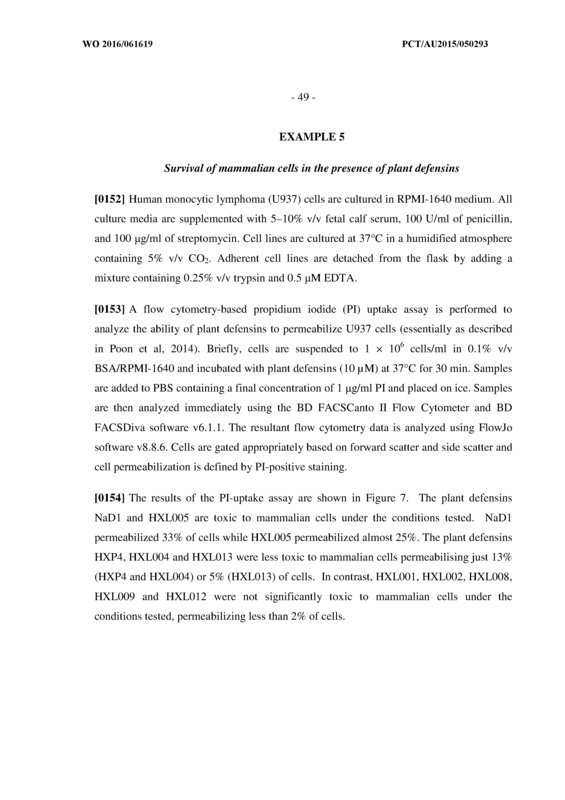 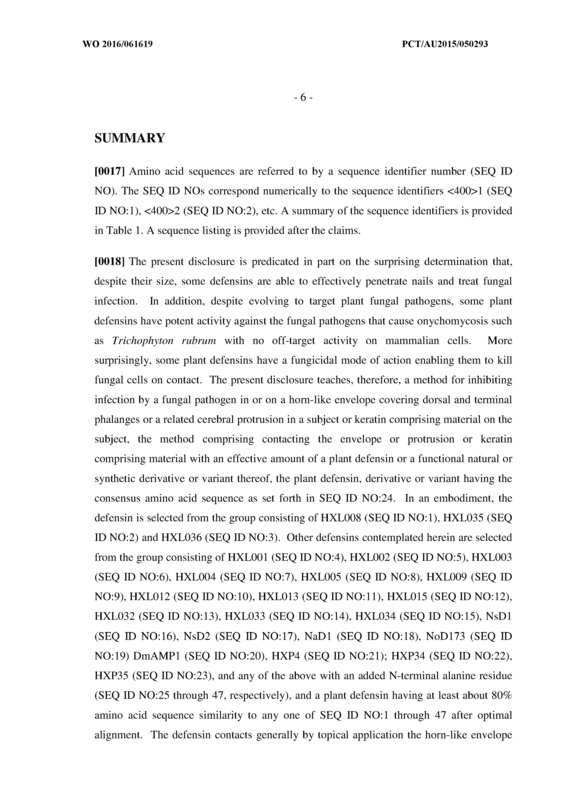 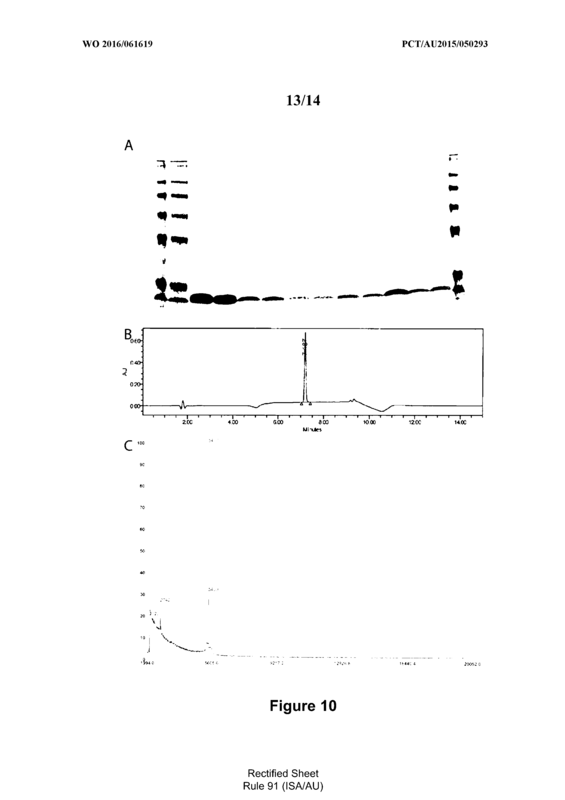 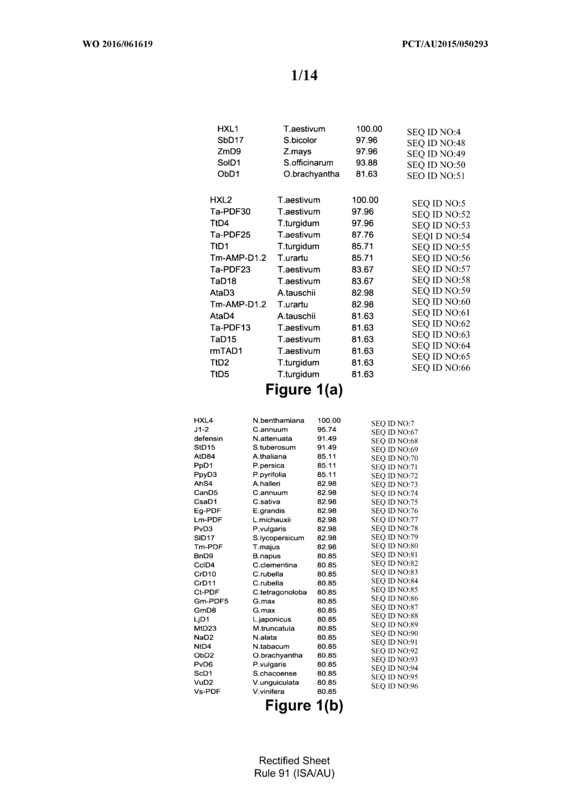 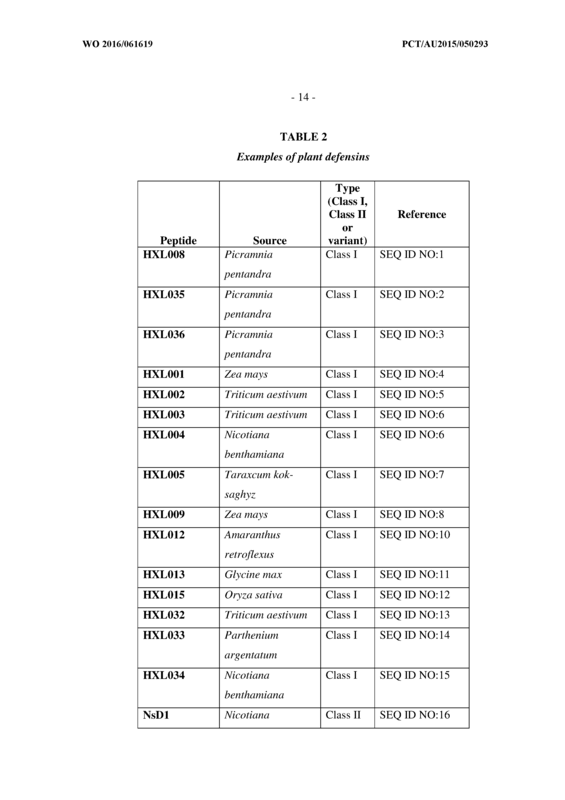 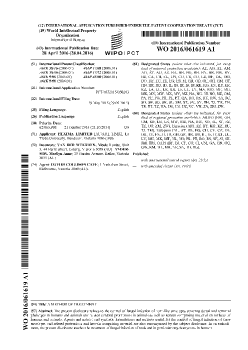 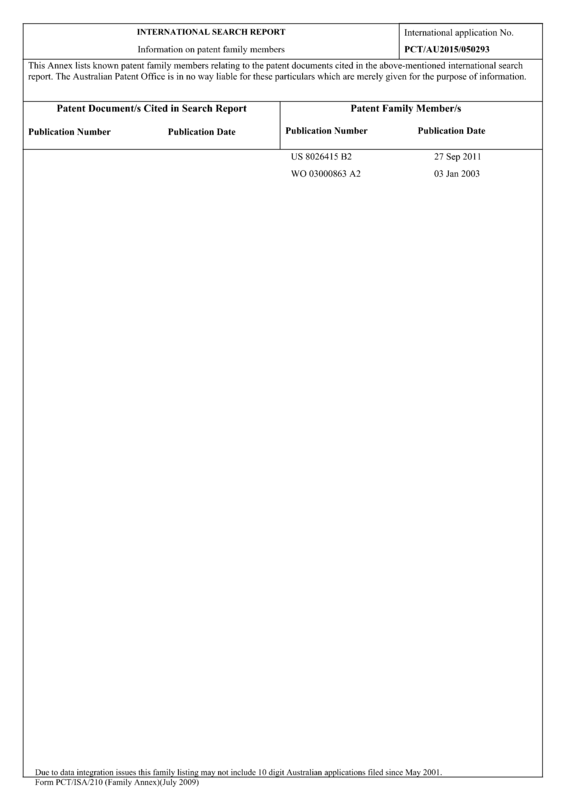 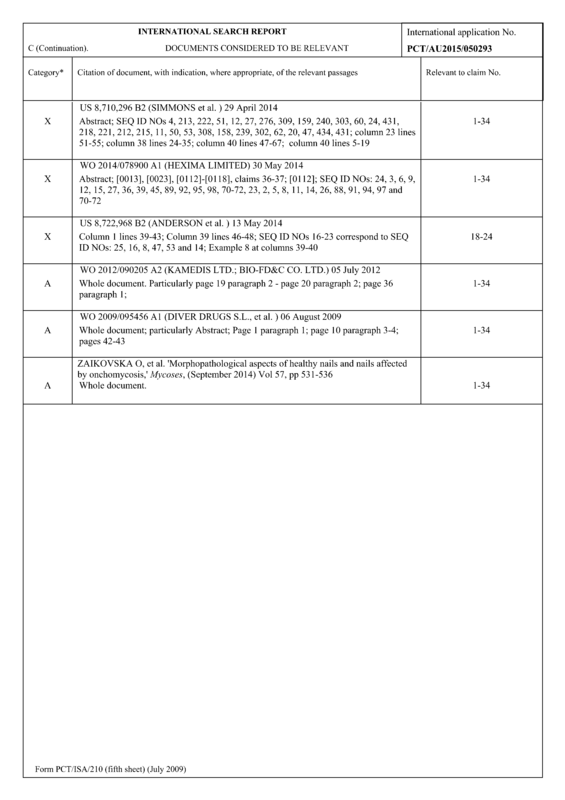 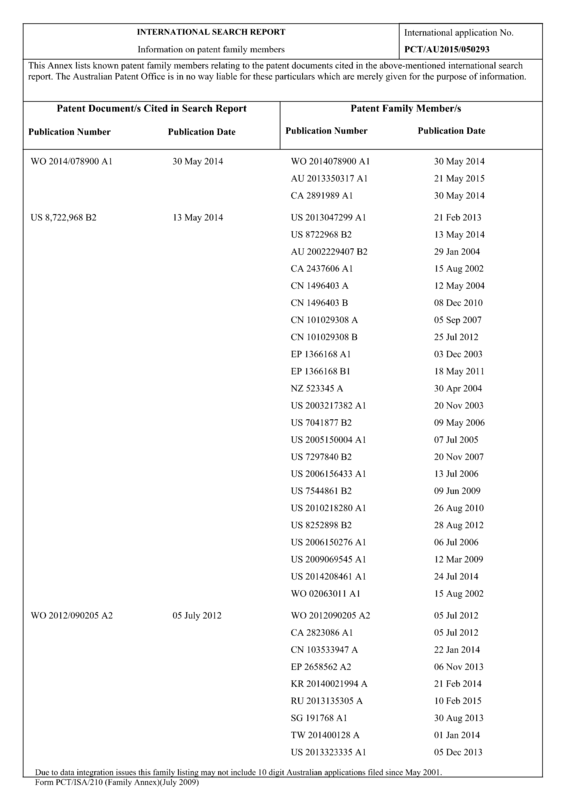 A topical formulation or cell or plant extract comprising a plant defensin selected from SEQ ID NO: l through 47 or a functional natural or synthetic derivative or variant thereof or a defensin having at least 80% similarity to any one of SEQ ID NO: l through 47 after optimal alignment or a defensin selected from SEQ ID NO: l through 23 with an N- terminal alanine residue (SEQ ID NO:25 through 47) for a time and under conditions sufficient to ameliorate symptoms of the infection and one or more pharmaceutically or veterinary acceptable carriers, diluents and/or excipients for use in treating onychomycosis or a related condition. 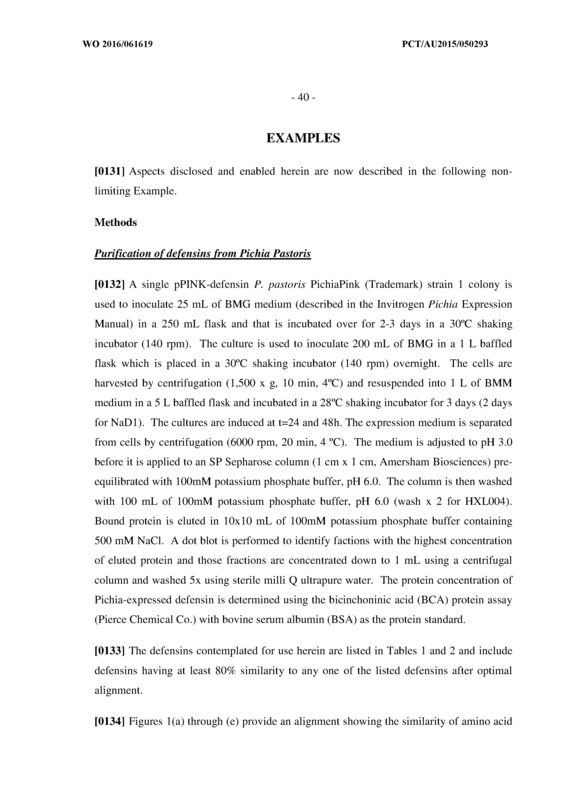 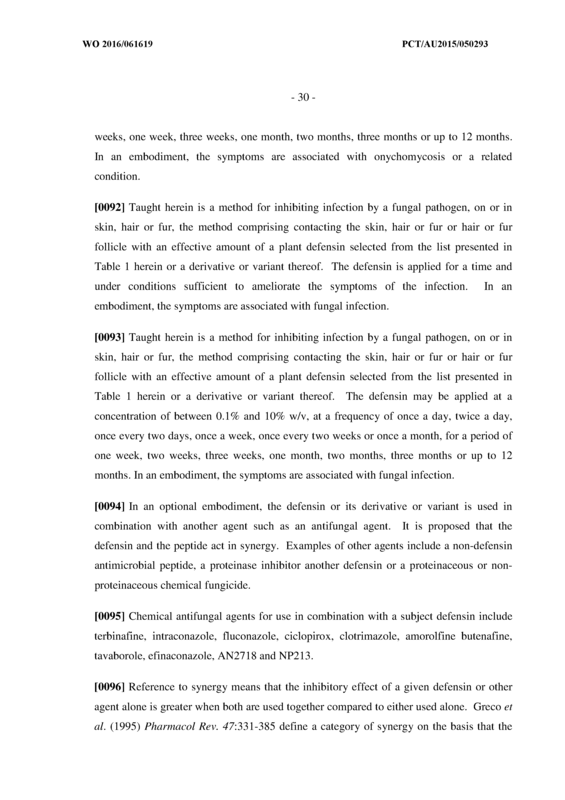 The formulation or cell or plant extract of Claim 18 wherein the related condition is tinea. 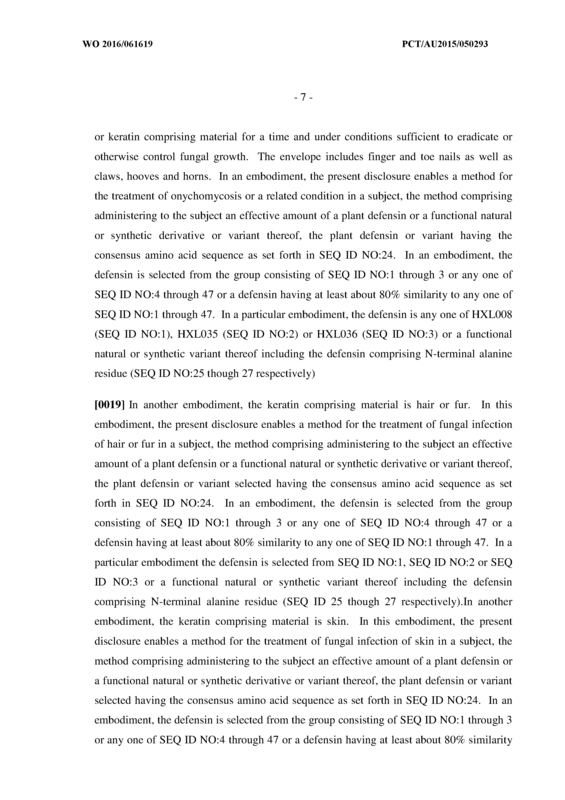 A topical formulation or cell or plant extract comprising a plant defensin selected from SEQ ID NO: l through 47 or a functional natural or synthetic derivative or variant thereof or a defensin having at least 80% similarity to any one of SEQ ID NO: l through 47 after optimal alignment or a defensin selected from SEQ ID NO: l through 23 with an N- terminal alanine residue (SEQ ID NO:25 through 47) for a time and under conditions sufficient to ameliorate symptoms of the infection and one or more pharmaceutically or veterinary acceptable carriers, diluents and/or excipients for use in treating infection of keratin comprising material. 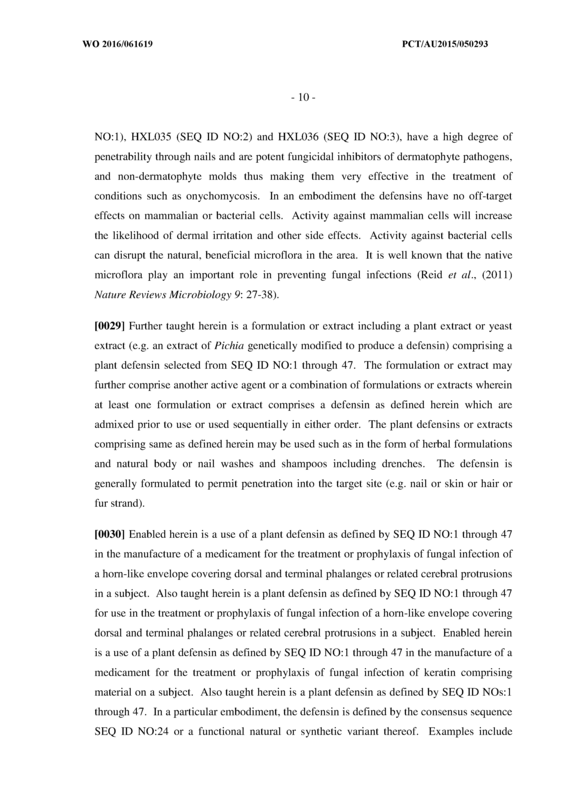 The formulation or cell or plant extract of Claim 20 wherein the keratin comprising material is hair, fur or skin. 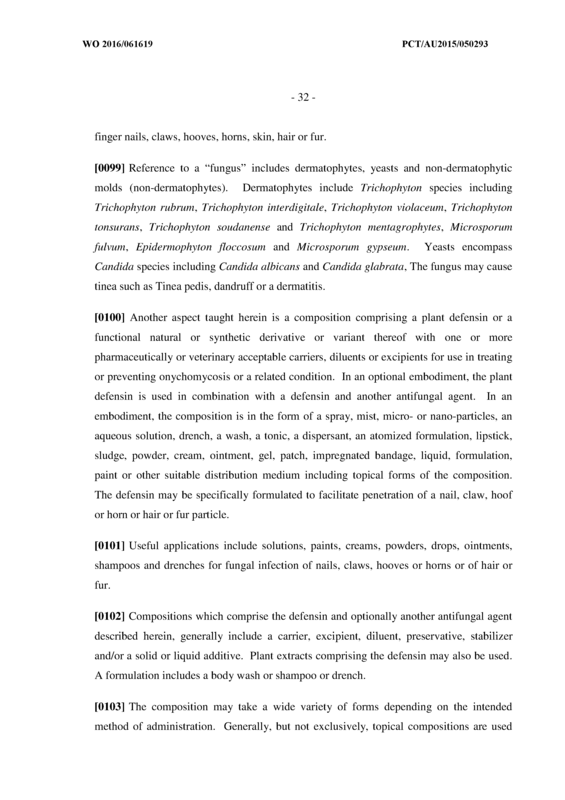 The formulation or cell or plant extract of any one of Claims 18 to 21 wherein the formulation is a body or hair wash or paint, spray, drops, cream or lotion applicator. 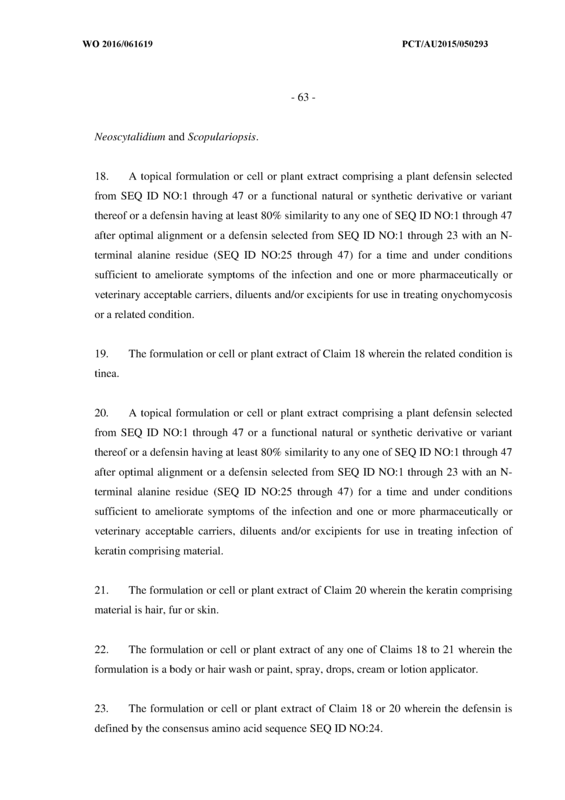 The formulation or cell or plant extract of Claim 18 or 20 wherein the defensin is defined by the consensus amino acid sequence SEQ ID NO:24. 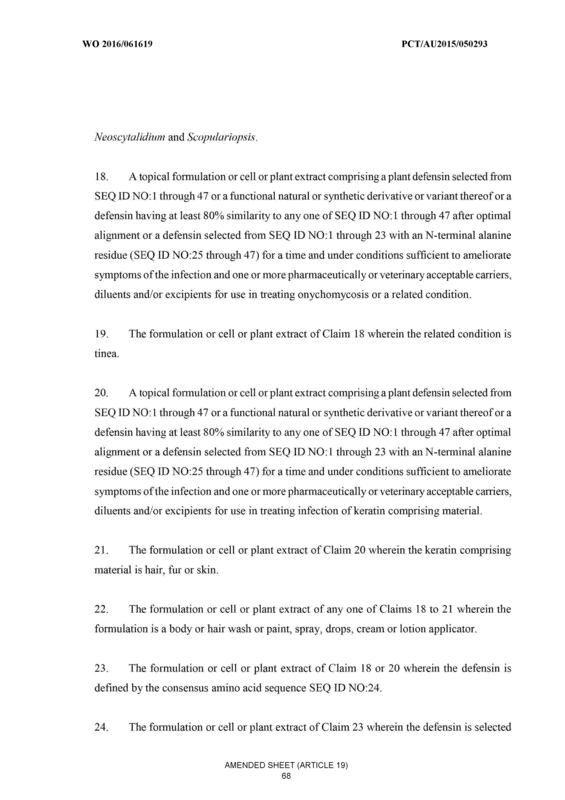 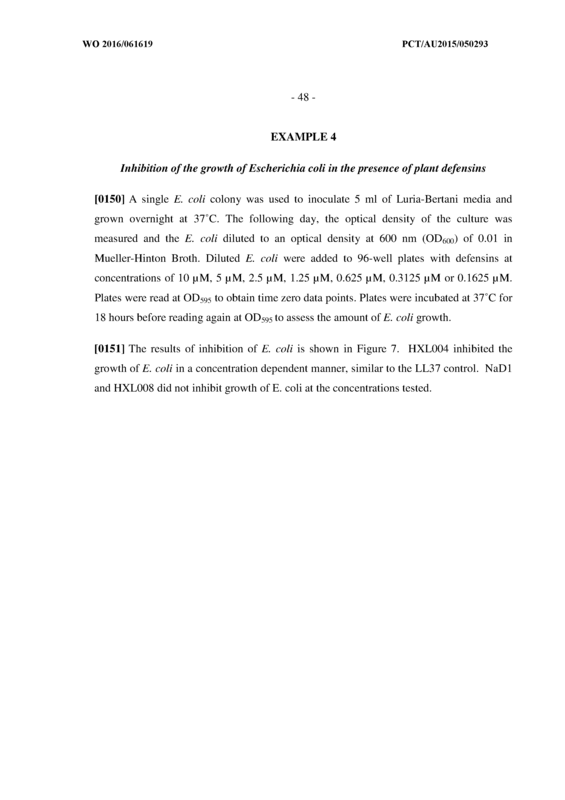 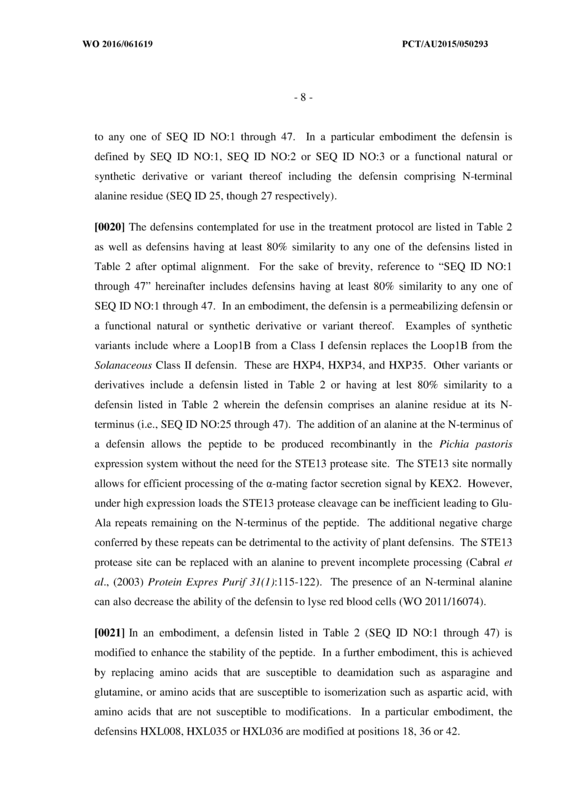 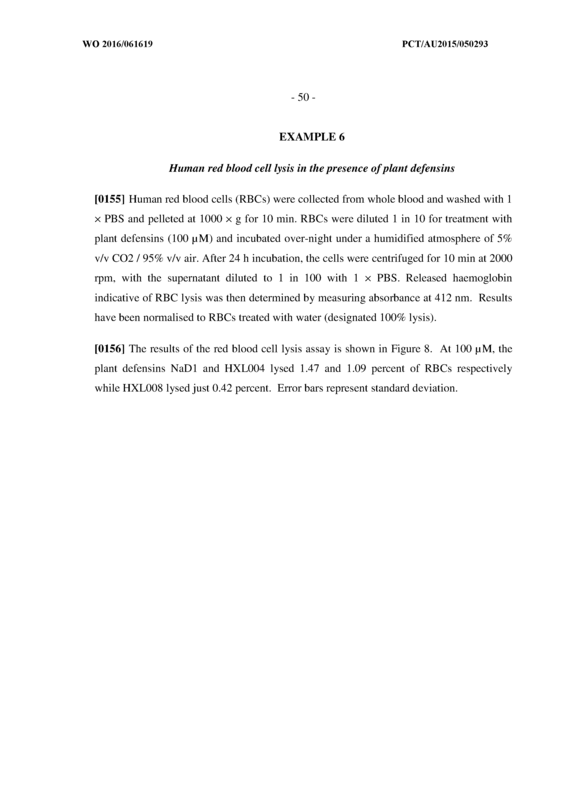 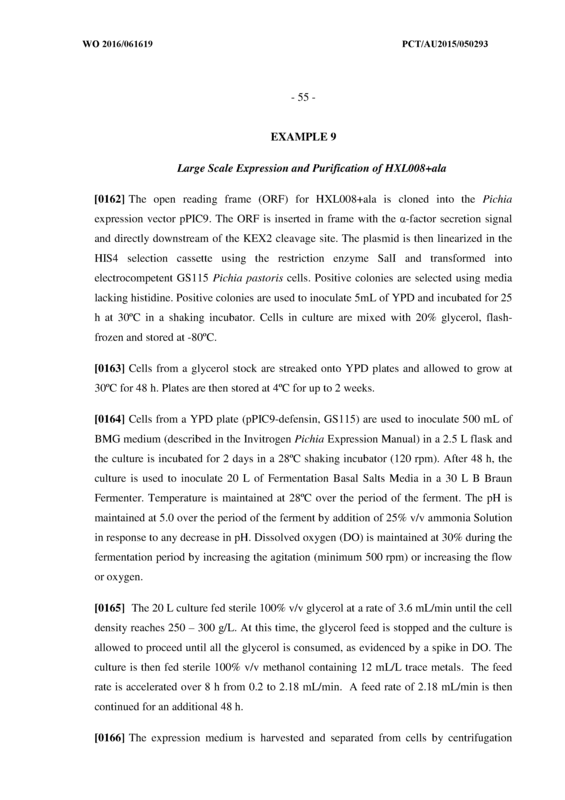 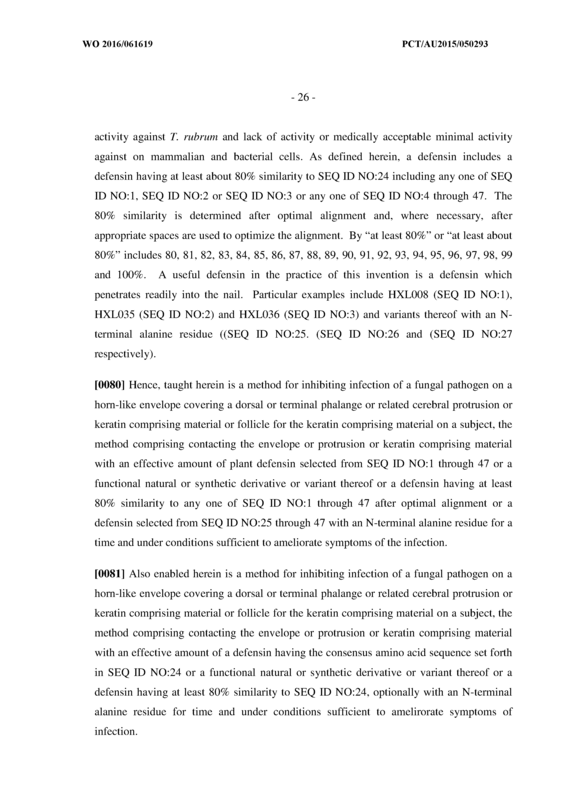 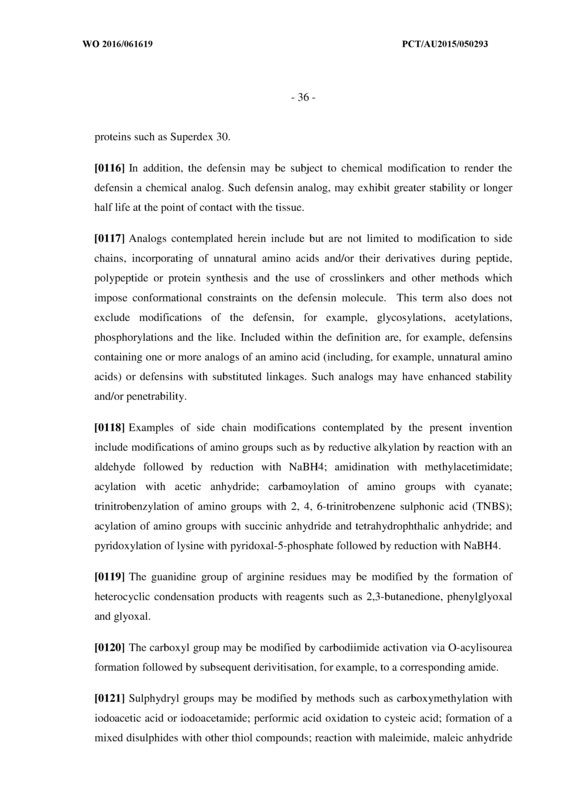 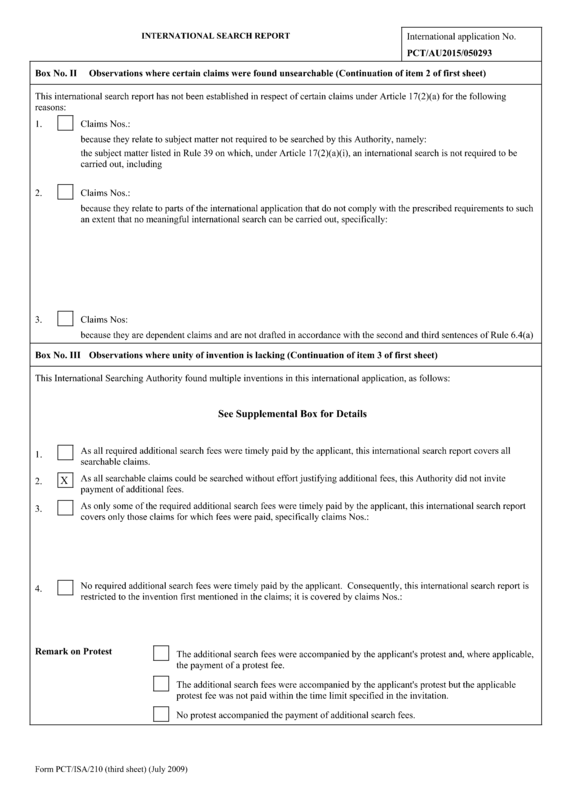 The formulation or cell or plant extract of Claim 23 wherein the defensin is selected from the group consisting of SEQ ID NO: 1, SEQ ID NO:2 and SEQ ID NO:3. 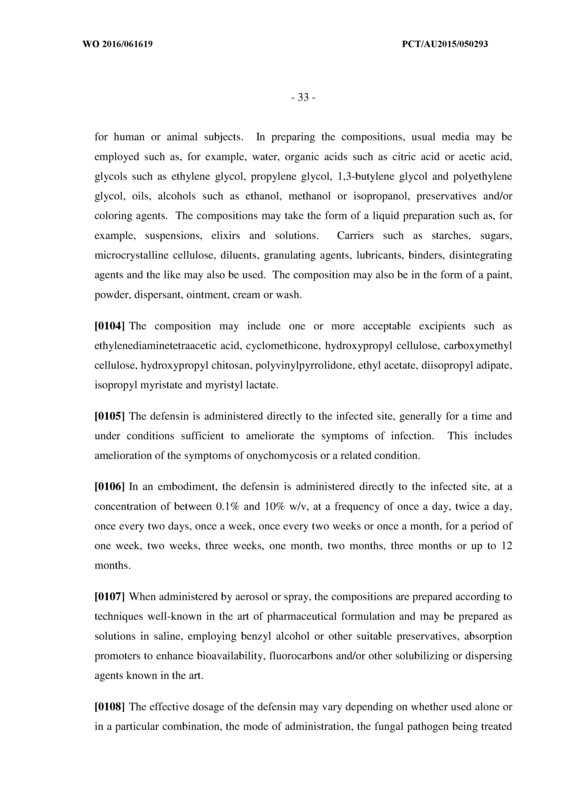 Use of a formulation or cell or plant extract of any one of Claims 18 to 24 in the manufacture of a medicament for the treatment or prophylaxis of onychomycosis or a related condition in a human or animal subject. 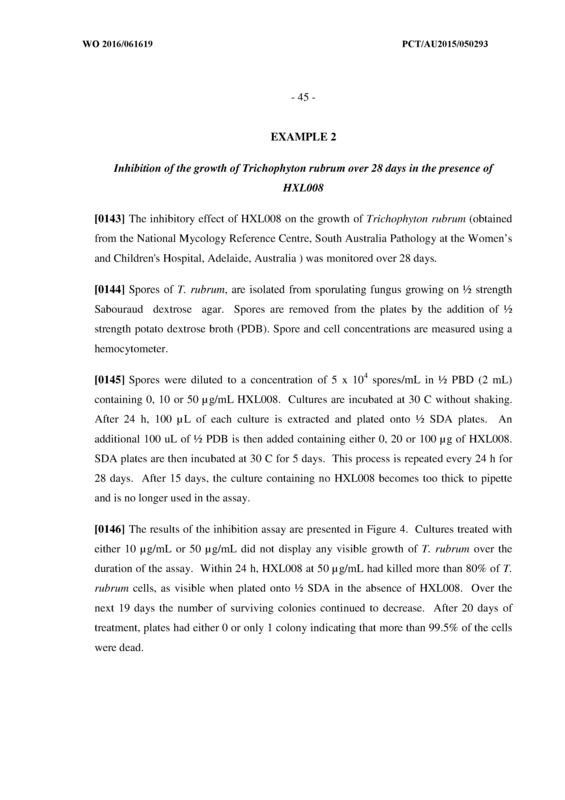 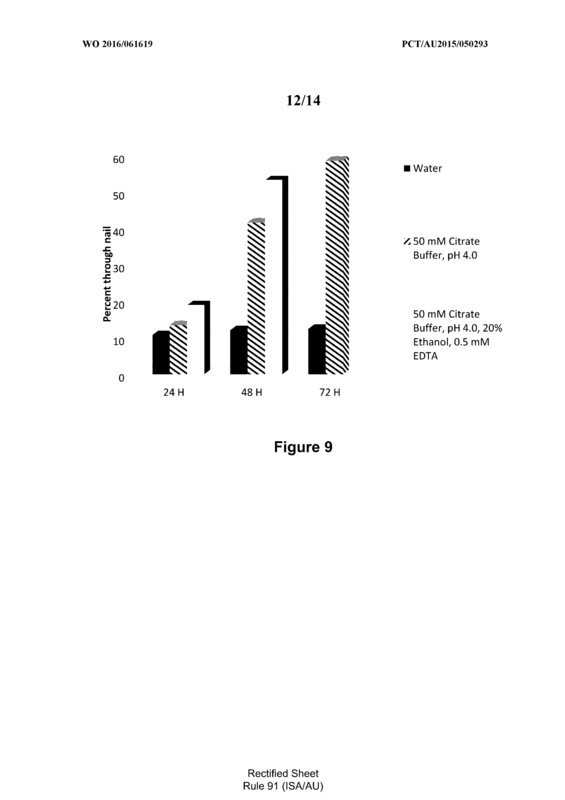 Use of a formulation or cell or plant extract of any one of Claims 18 to 24 in the manufacture of a medicament for the treatment or prophylaxis of keratin comprising material on a human or animal subject. 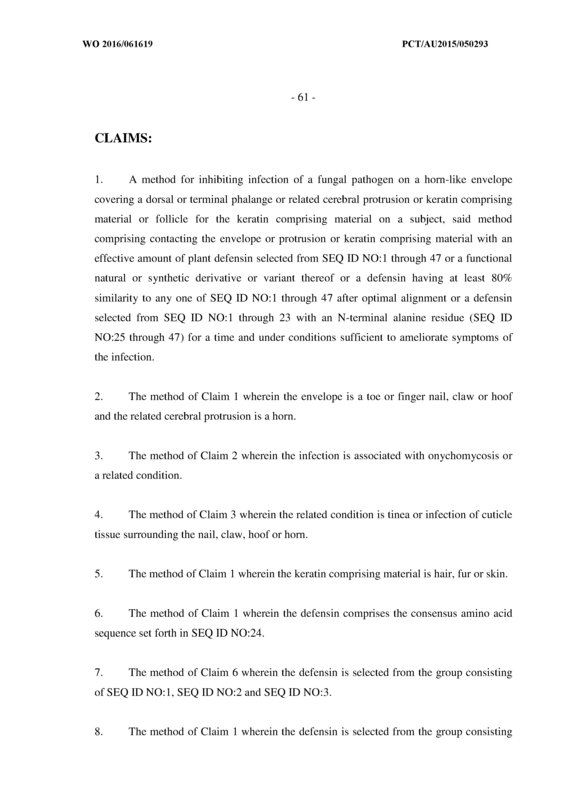 Use of Claim 26 wherein the keratin comprising material is hair, fur or skin. 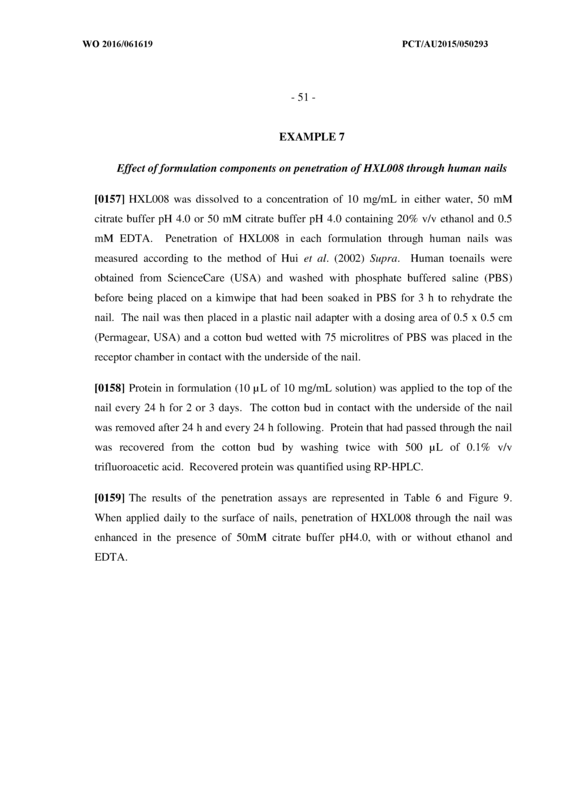 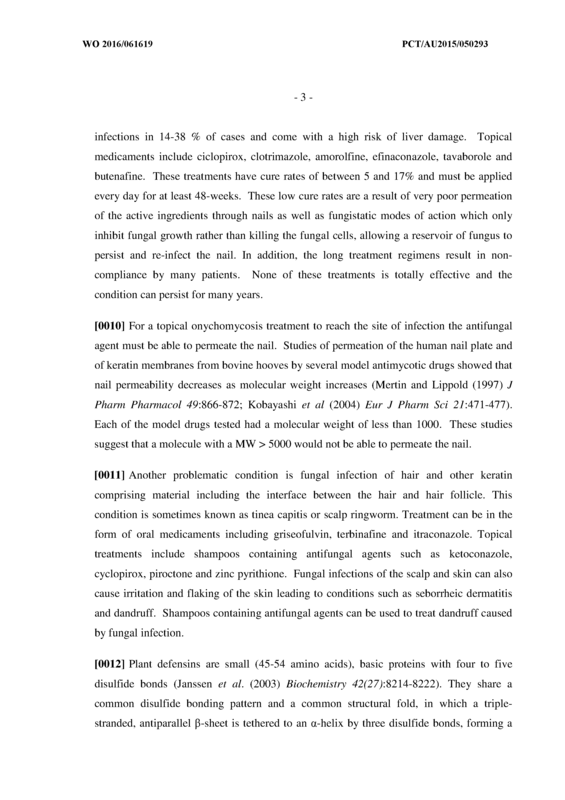 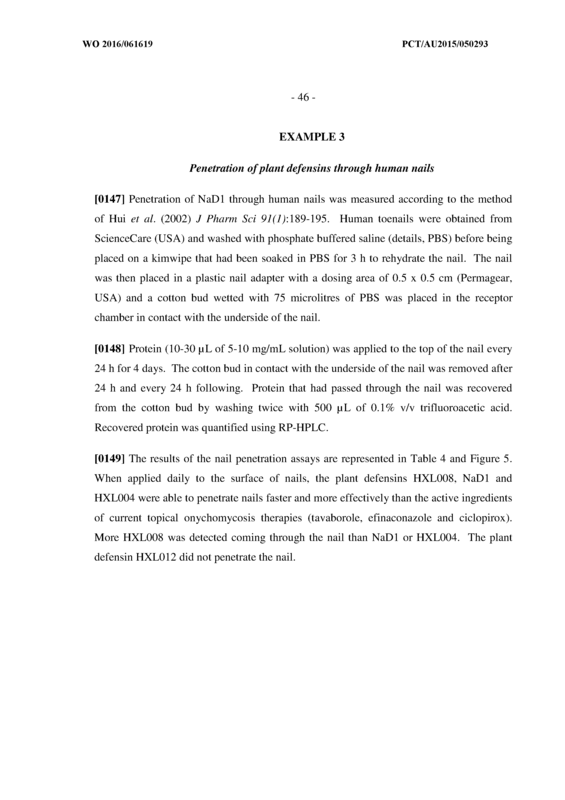 A method for inhibiting infection of a fungal pathogen on a nail, claw, hoof or horn, said method comprising contacting the nail, claw, hoof or horn with an effective amount of a plant defensin selected from SEQ ID NO: l through 47 or a functional natural or synthetic derivative or variant thereof or a defensin having at least 80% similarity to any one of SEQ ID NO: l through 47 after optimal alignment or a defensin selected from SEQ ID NO: l through 23 with an N-terminal alanine residue (SEQ ID NO:25 through 47) for a time and under conditions sufficient to ameliorate symptoms of the infection for a time and under conditions sufficient to ameliorate symptoms. 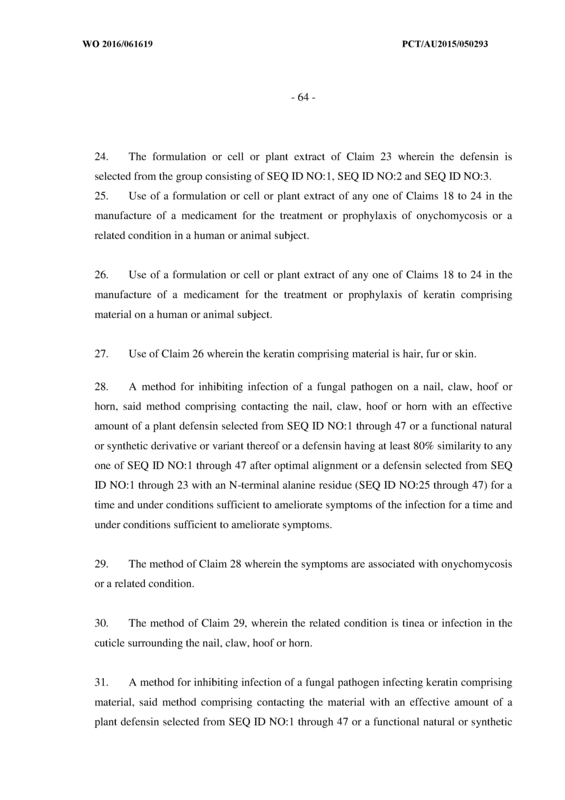 The method of Claim 28 wherein the symptoms are associated with onychomycosis or a related condition. 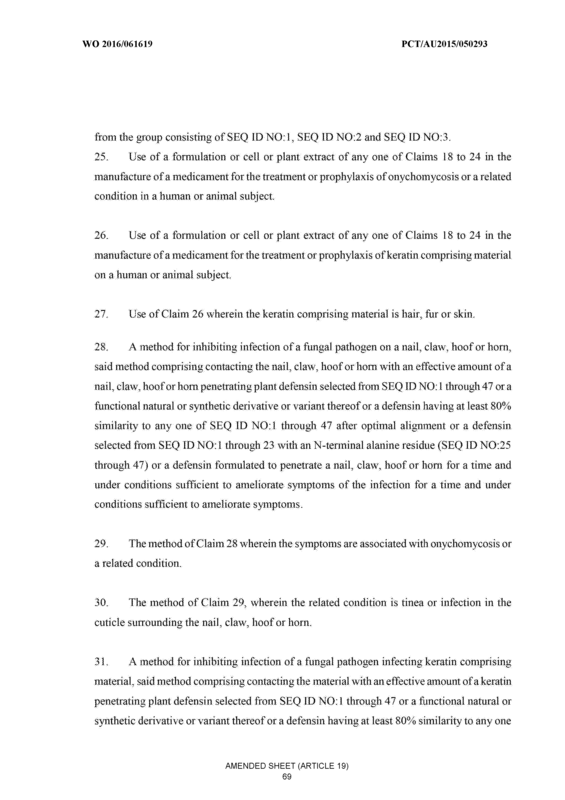 The method of Claim 29, wherein the related condition is tinea or infection in the cuticle surrounding the nail, claw, hoof or horn. 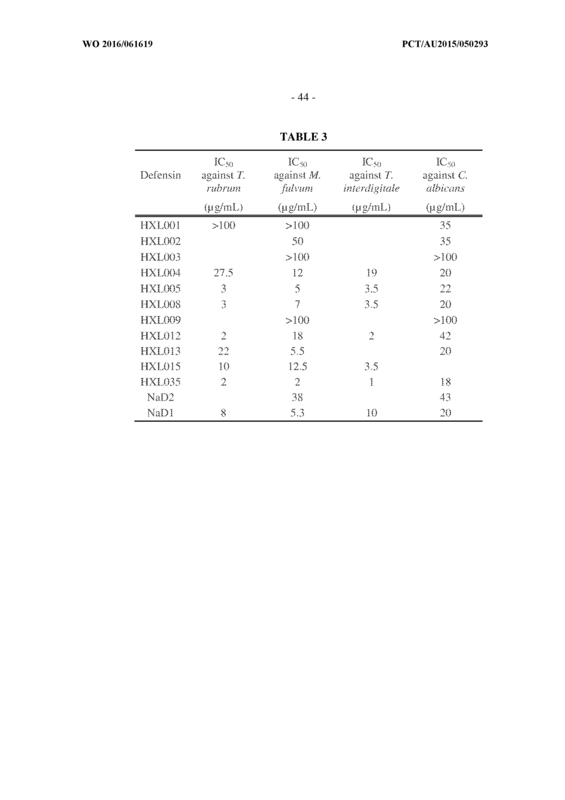 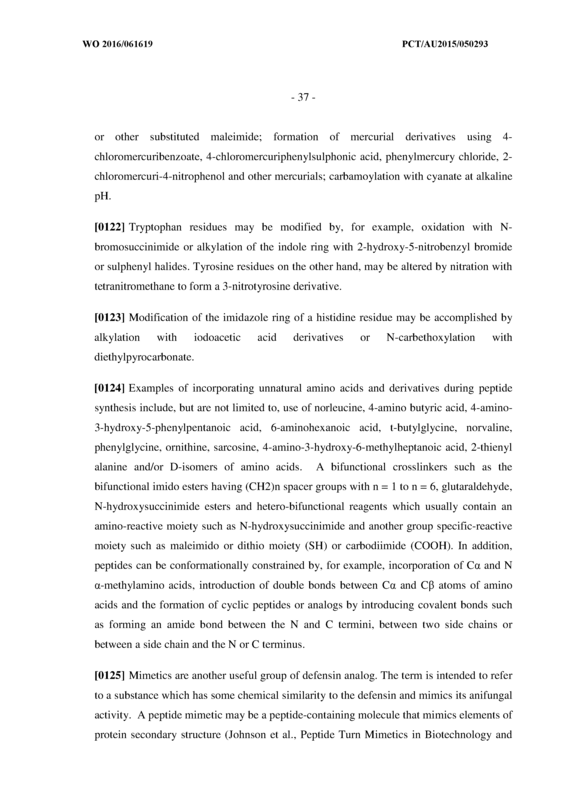 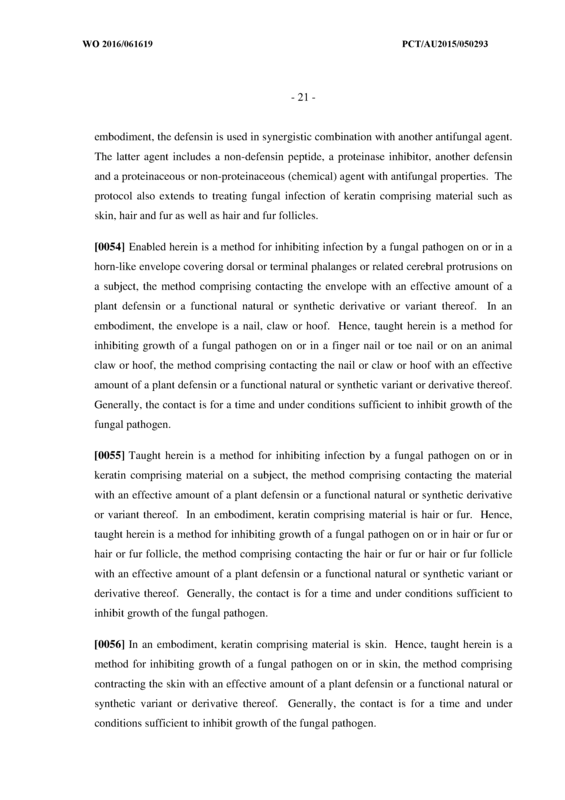 A method for inhibiting infection of a fungal pathogen infecting keratin comprising material, said method comprising contacting the material with an effective amount of a plant defensin selected from SEQ ID NO: l through 47 or a functional natural or synthetic derivative or variant thereof or a defensin having at least 80% similarity to any one of SEQ ID NO: l through 47 after optimal alignment or a defensin selected from SEQ ID NO: l through 23 with an N-terminal alanine residue (SEQ ID NO:25 through 47) for a time and under conditions sufficient to ameliorate symptoms of the infection for a time and under conditions sufficient to ameliorate symptoms. 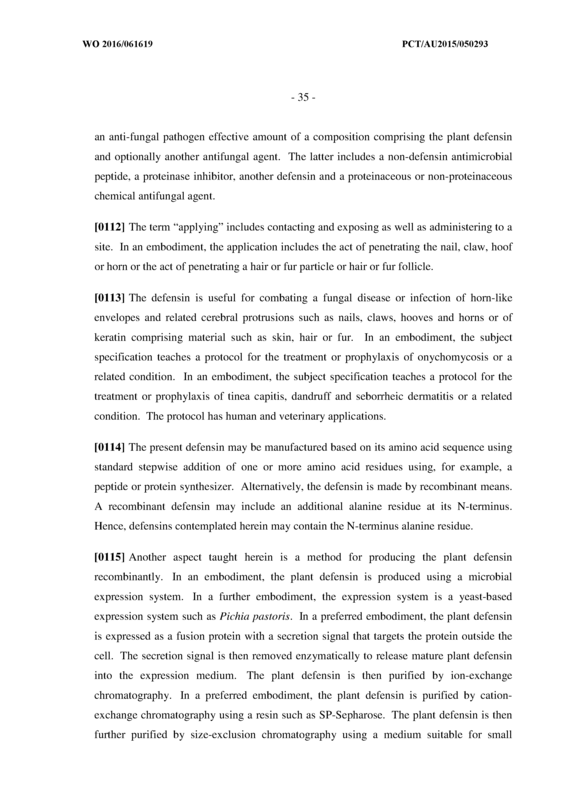 The method of Claim 31 wherein the keratin comprising material is hair, fur or skin. 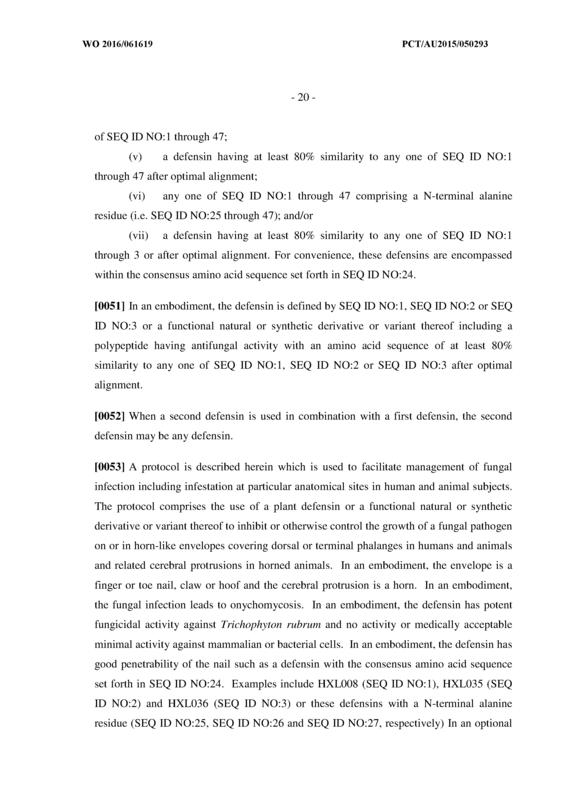 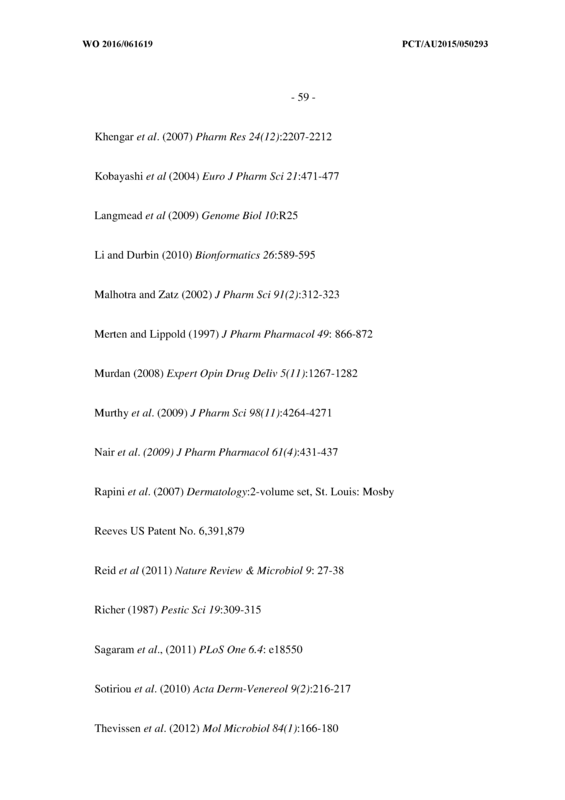 The method of Claim 28 or 31 wherein the defensin is defined by the consensus amino acid sequence SEQ ID NO:24. 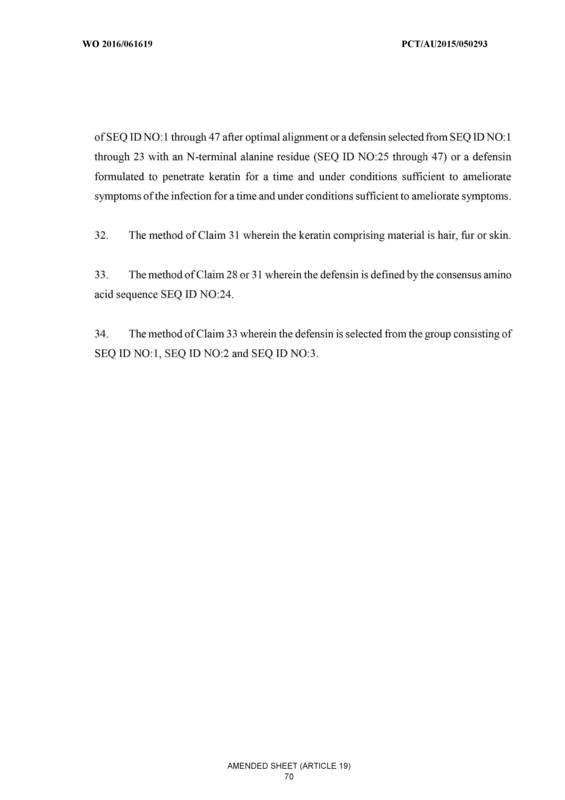 The method of Claim 33 wherein the defensin is selected from the group consisting of SEQ ID NO: l, SEQ ID NO:2 and SEQ ID NO:3.